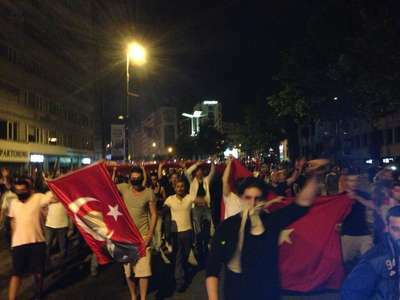 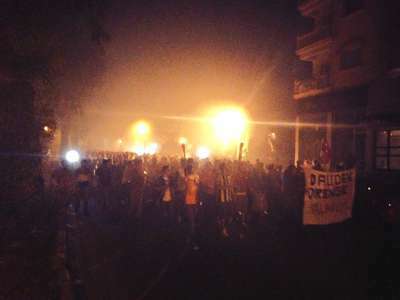 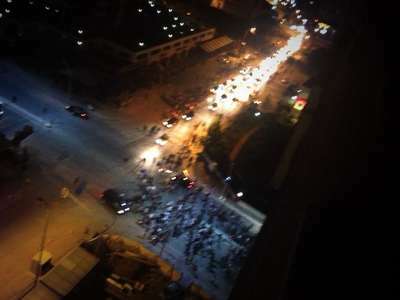 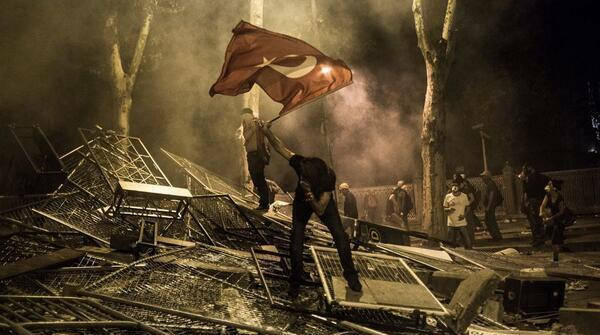 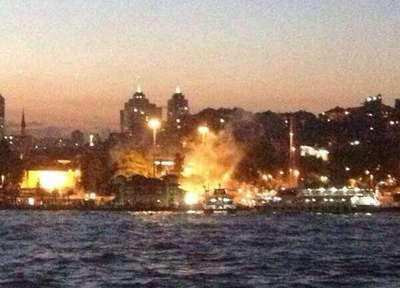 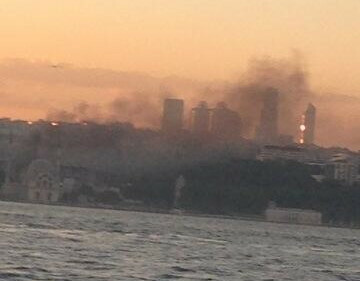 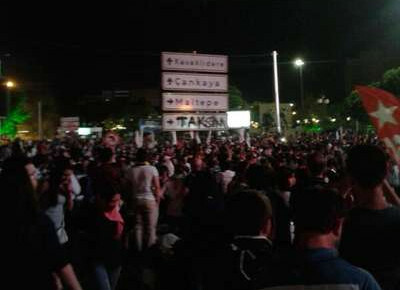 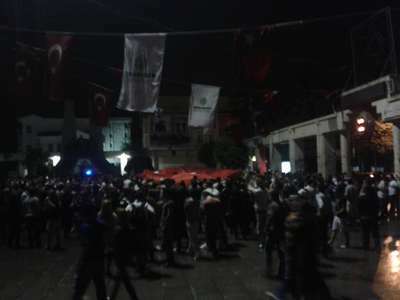 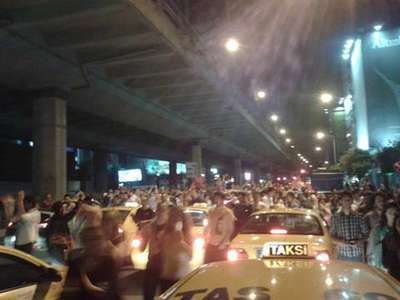 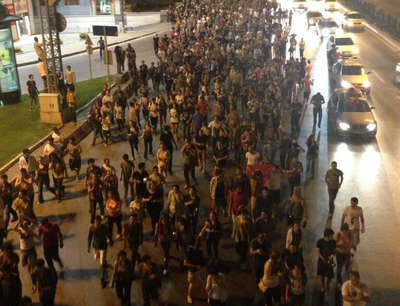 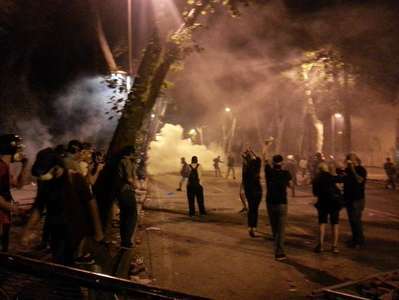 Severe clashes ongoing throughout the night spreaded all over Turkey to the point that people living in İstanbul started marching towards İstanbul to support the protest. 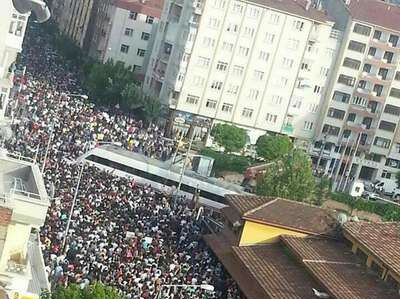 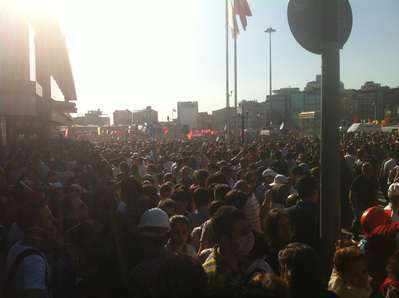 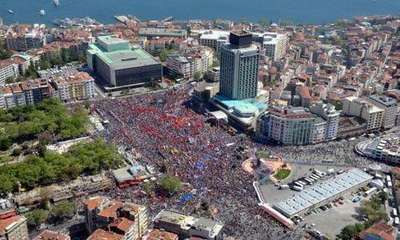 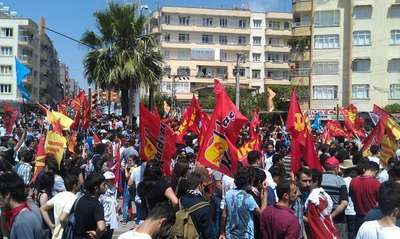 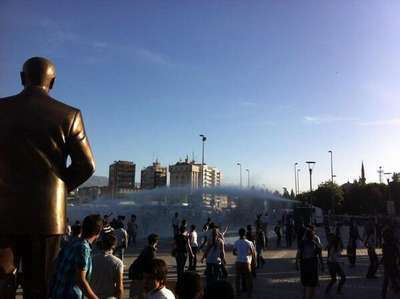 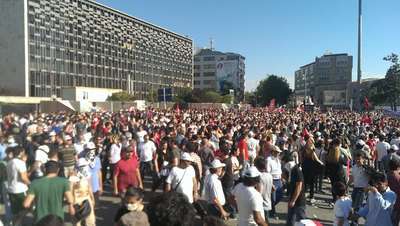 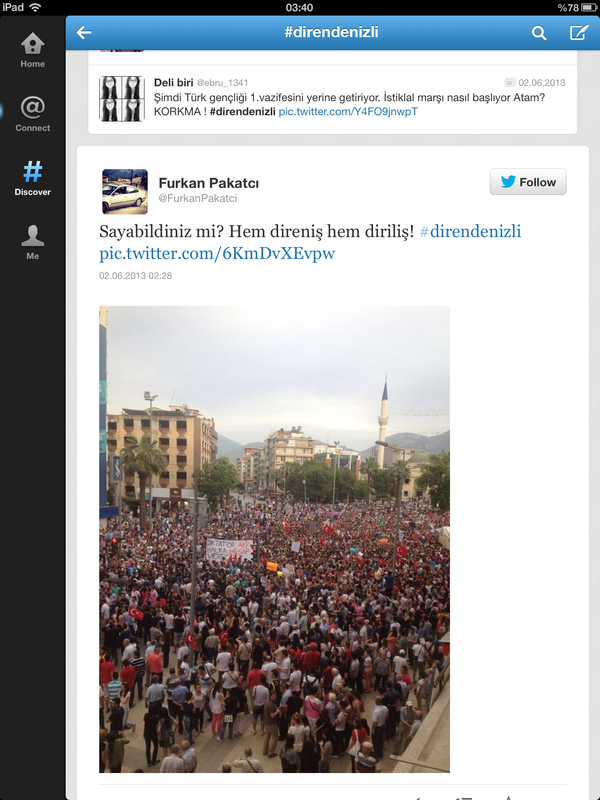 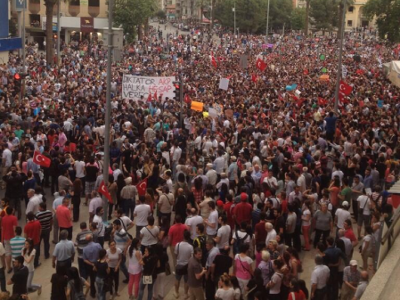 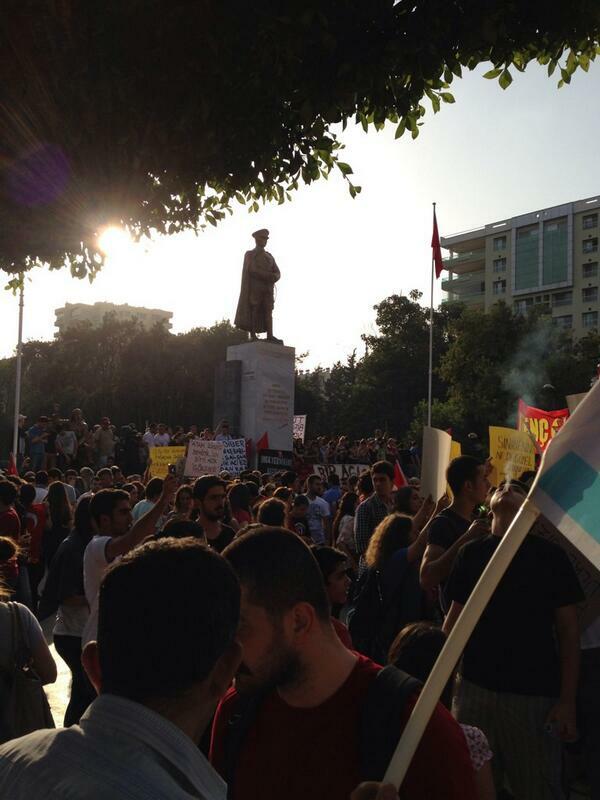 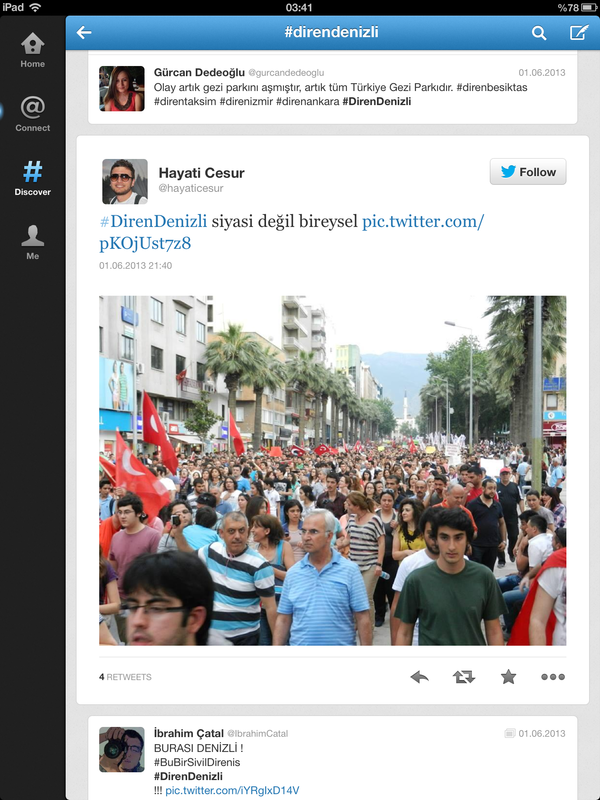 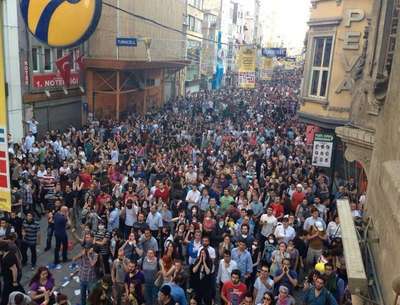 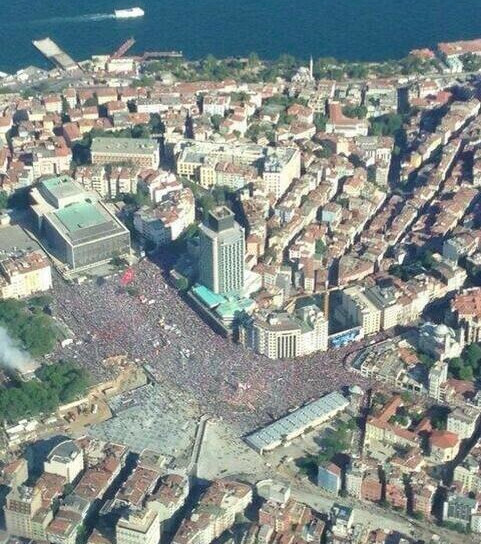 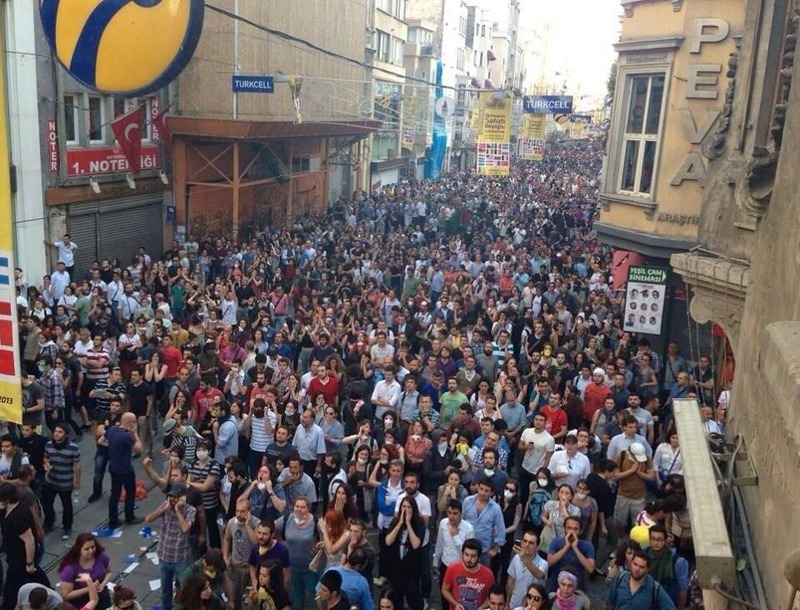 Taksim experienced the most crowded day of the protest. 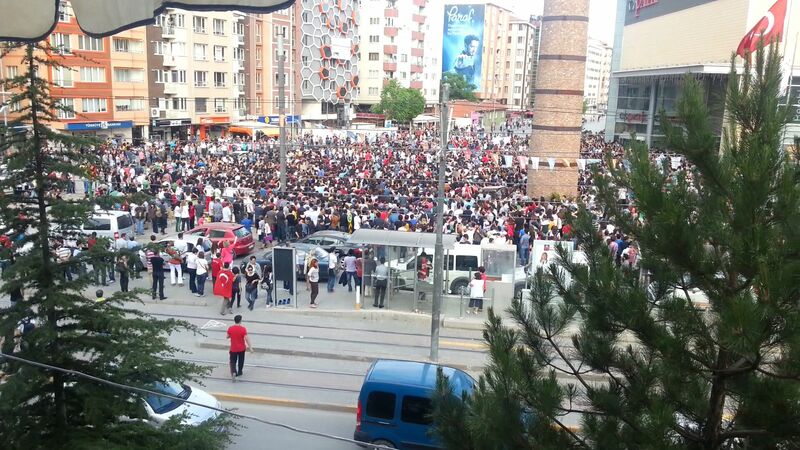 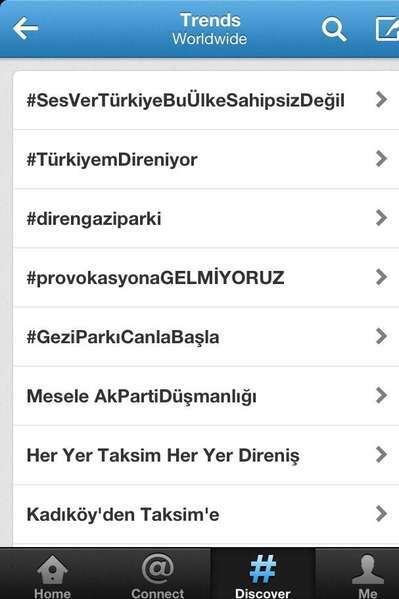 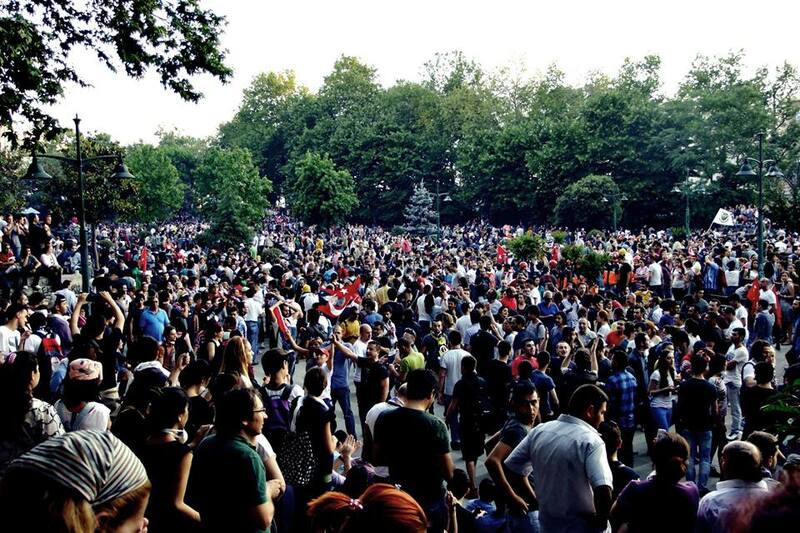 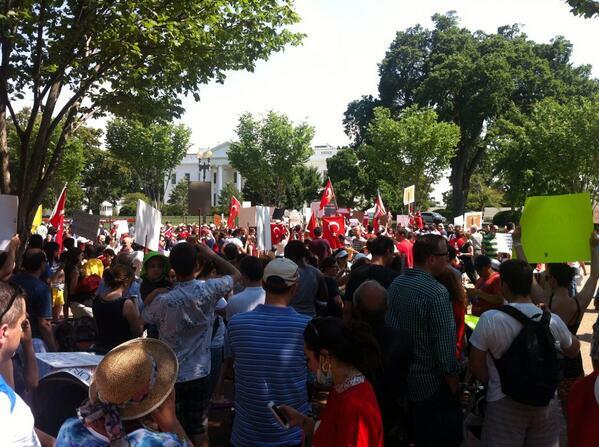 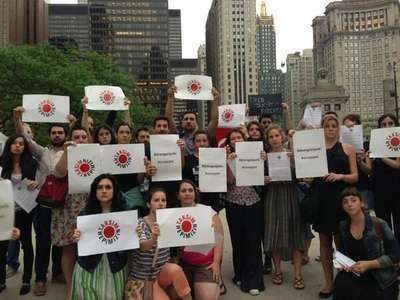 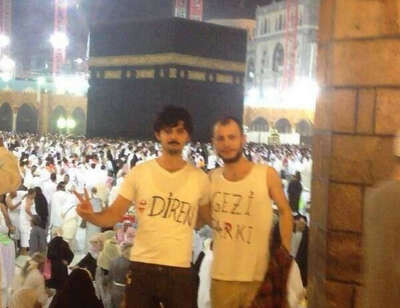 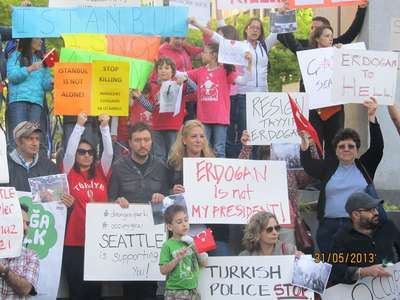 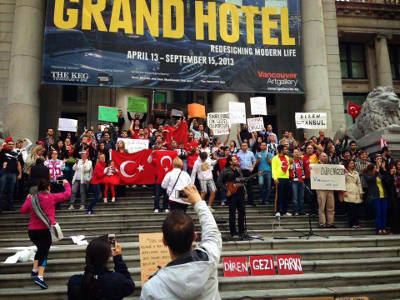 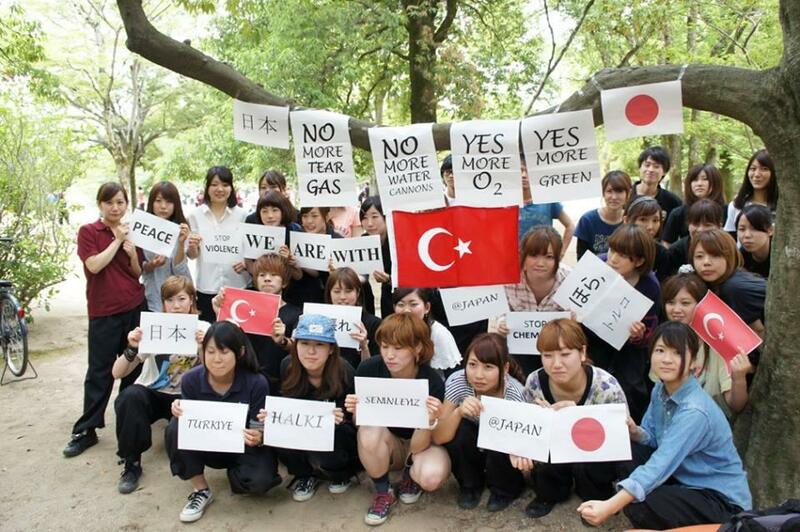 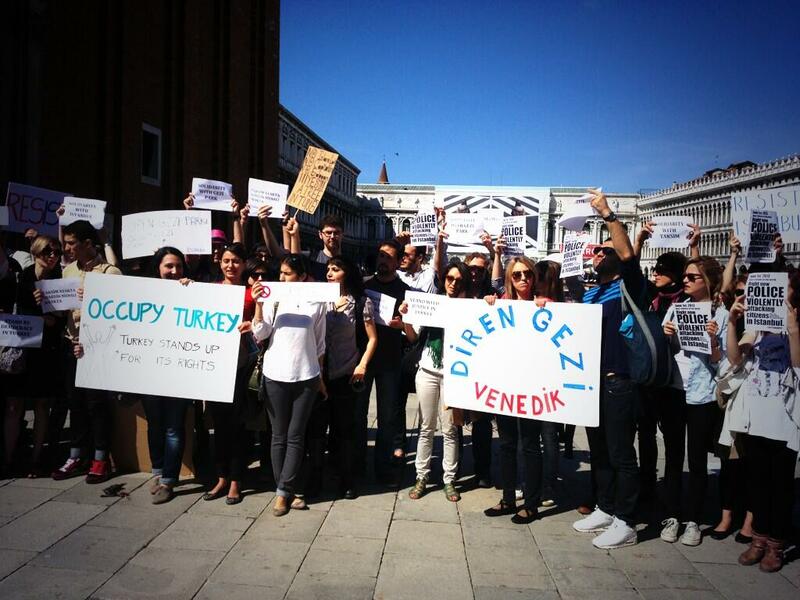 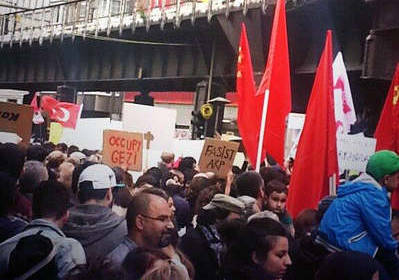 Later, similar protests started all over the Turkey and the world with an increasing number of people by time. 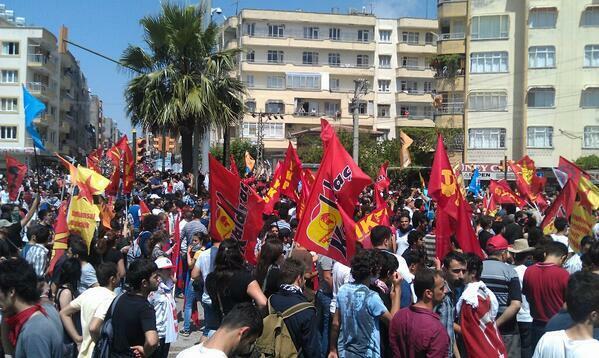 After midday, police forces started leaving Taksim. 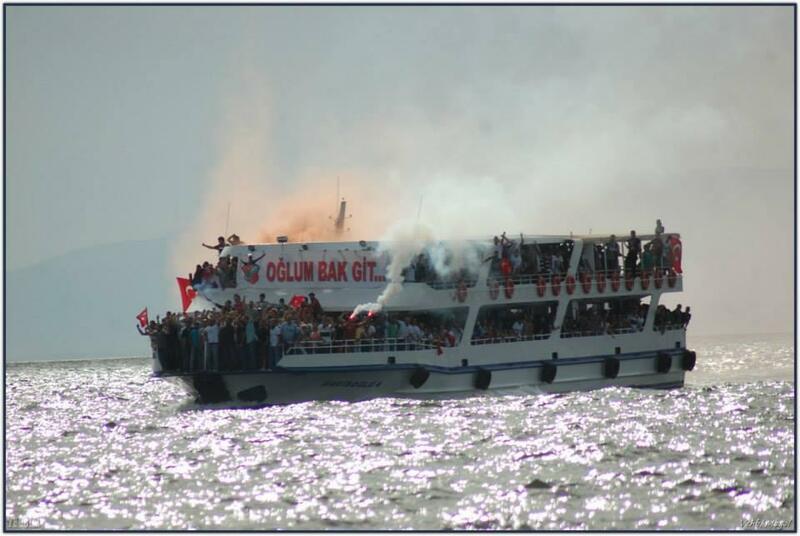 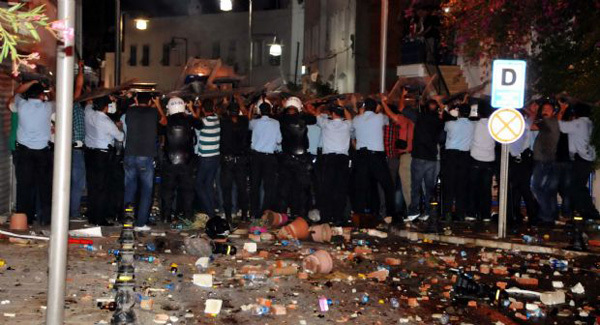 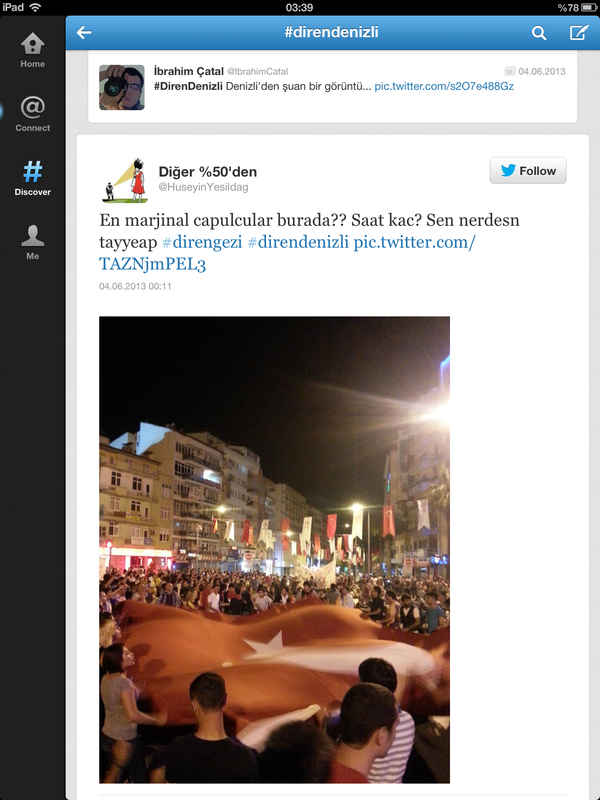 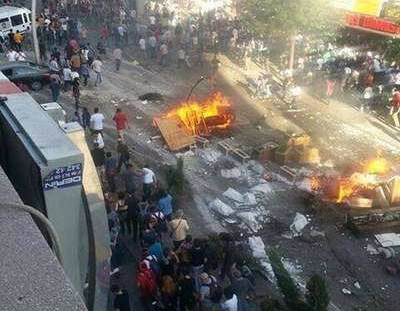 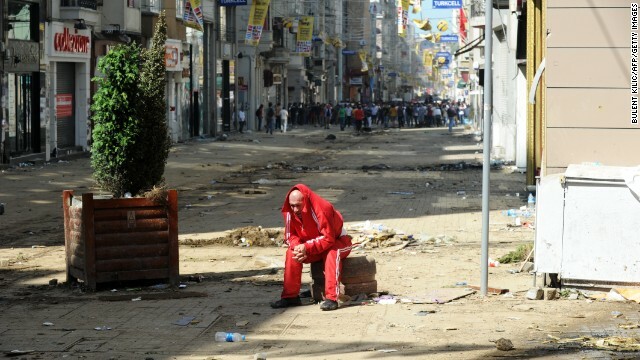 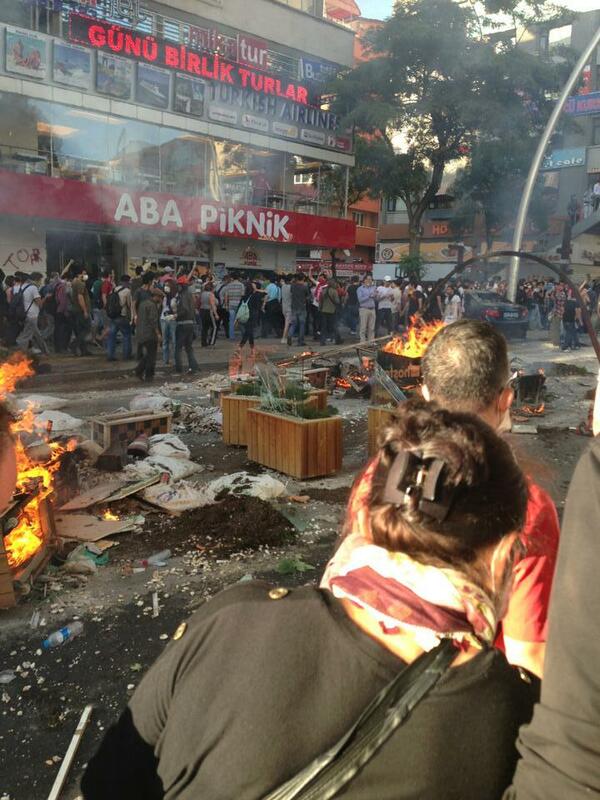 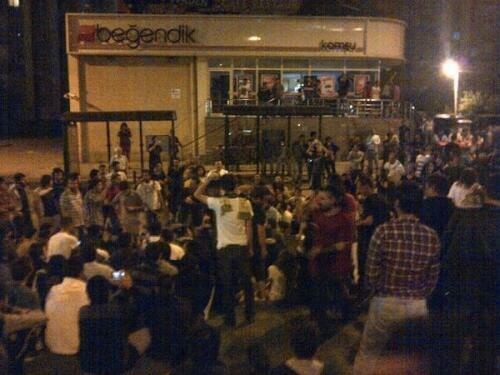 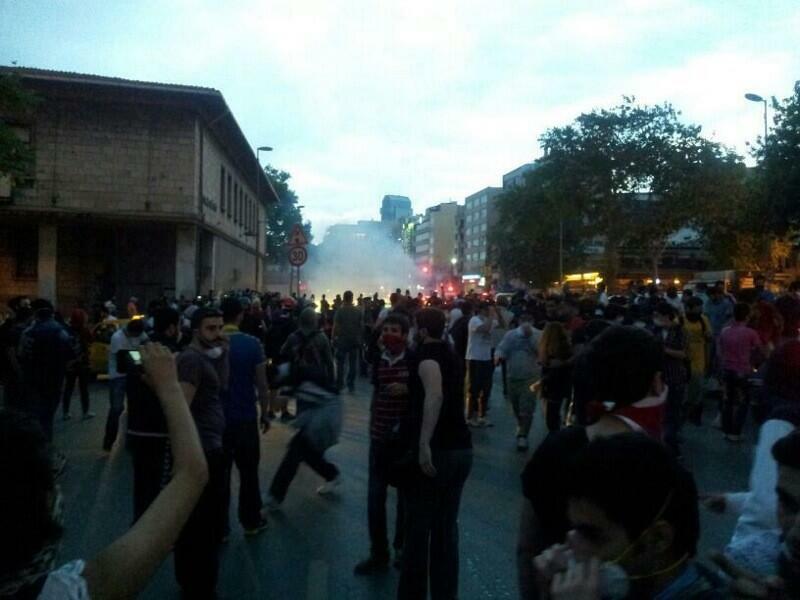 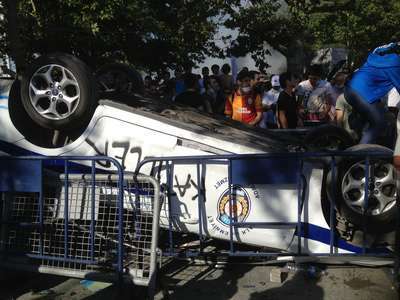 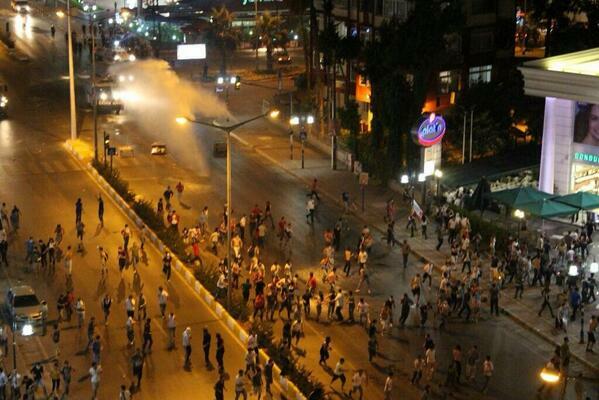 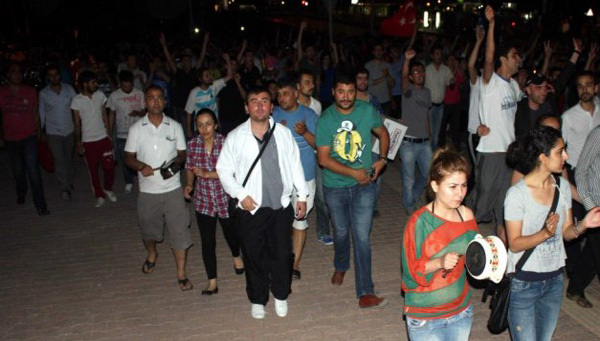 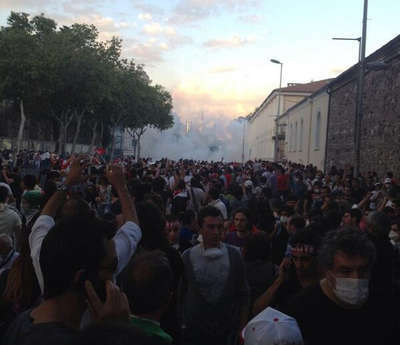 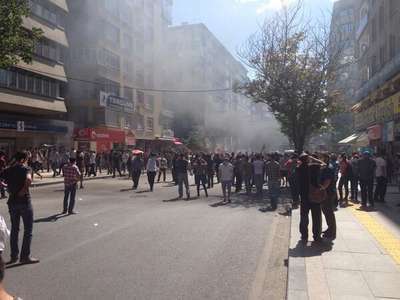 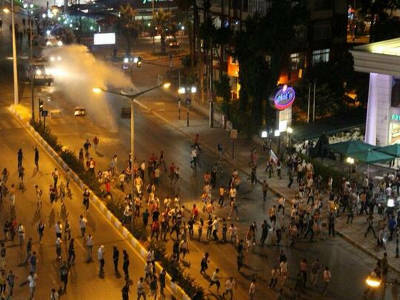 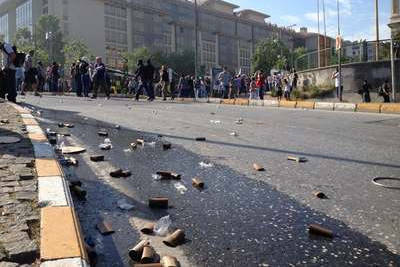 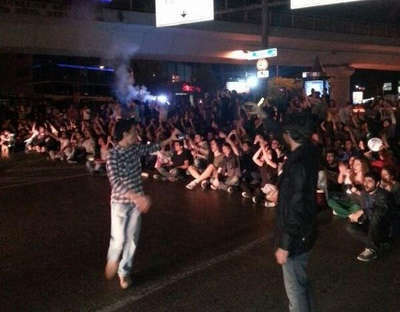 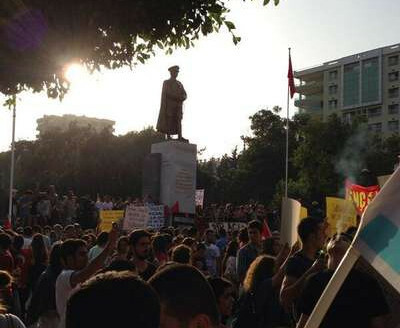 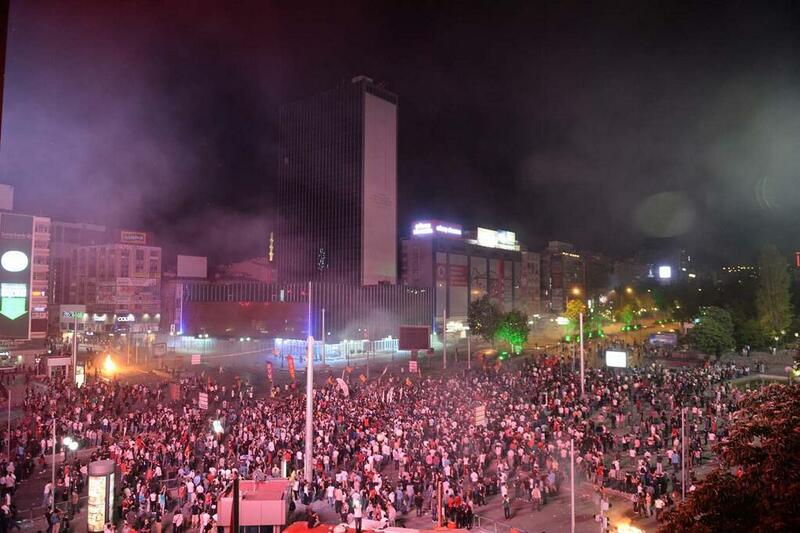 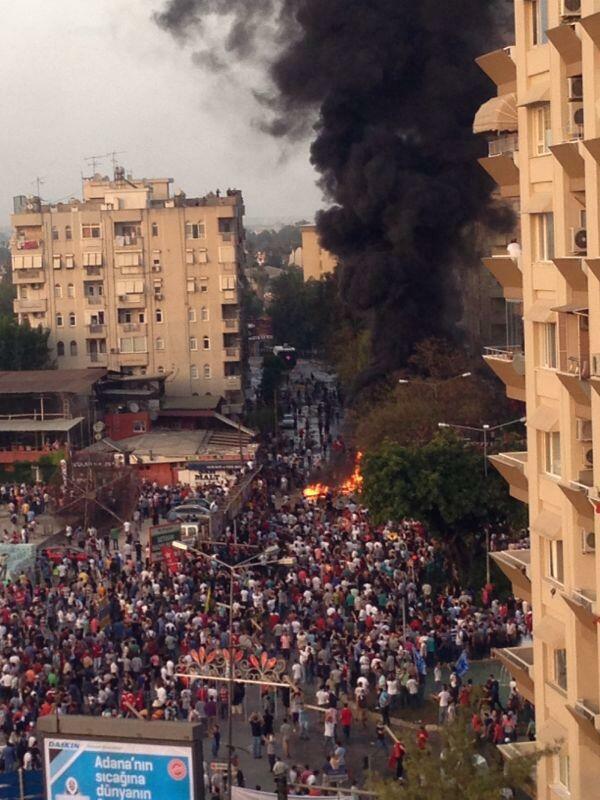 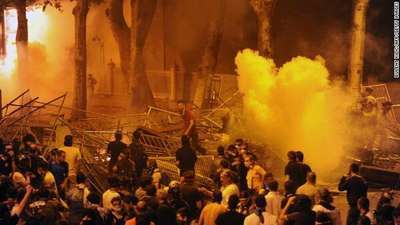 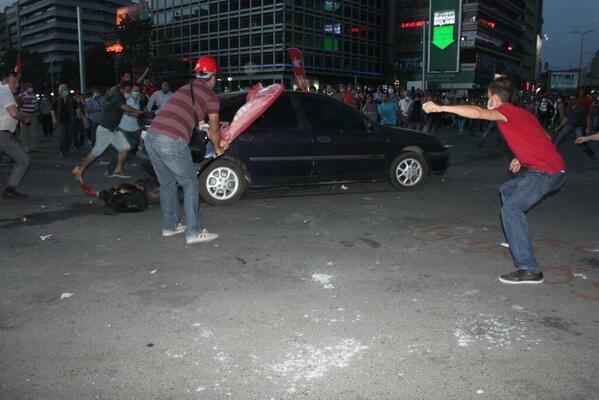 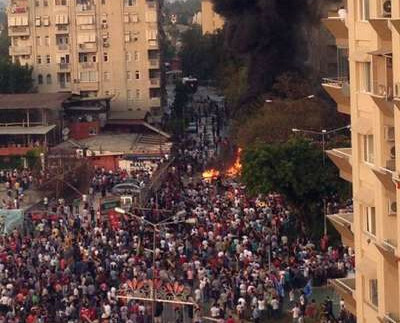 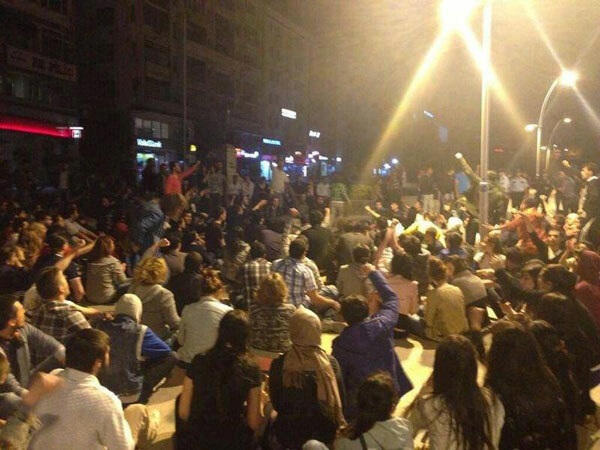 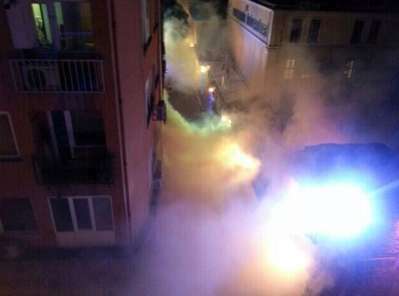 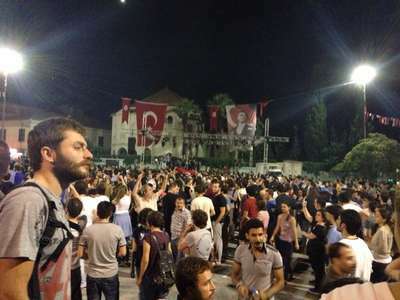 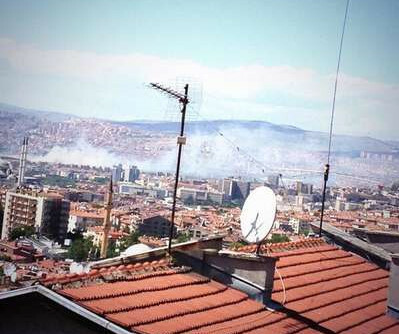 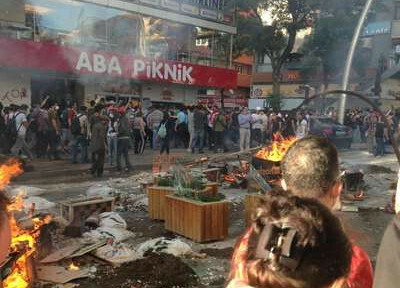 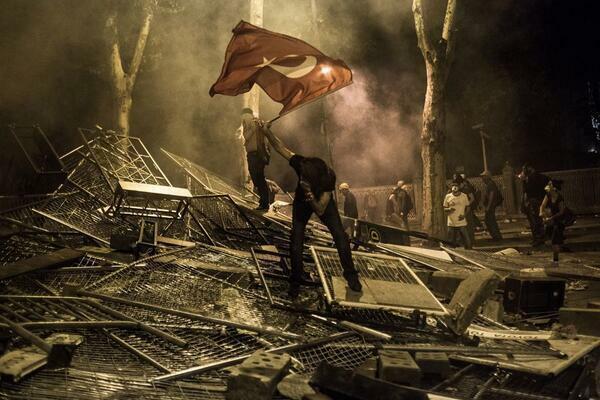 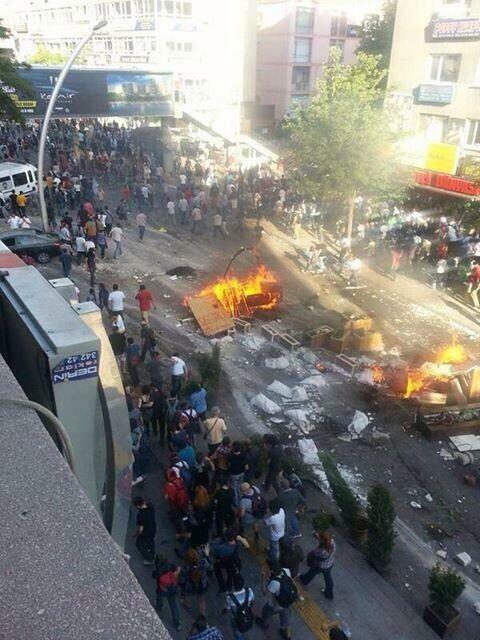 That being said, tension of the clashes in Beşiktaş, İzmir and Ankara was worsened. 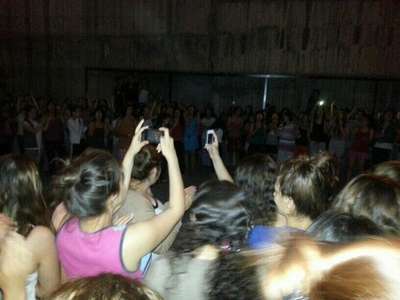 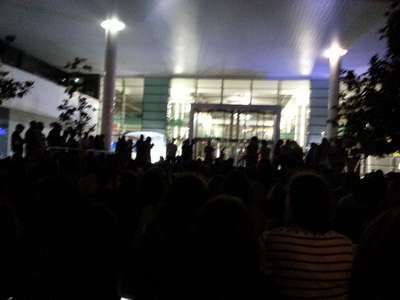 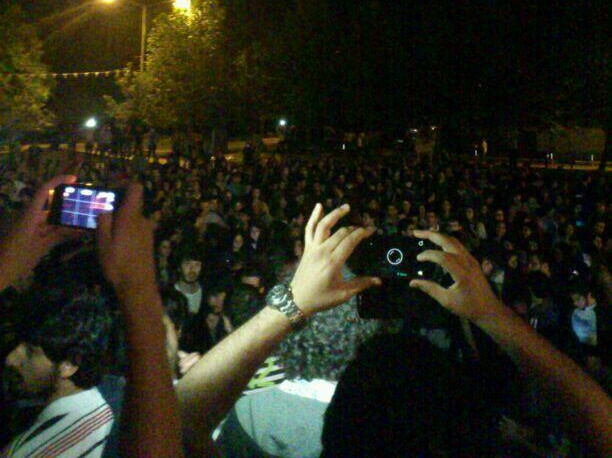 İstanbul Technical University students surround the entrance of a major TV channel (NTV) building. 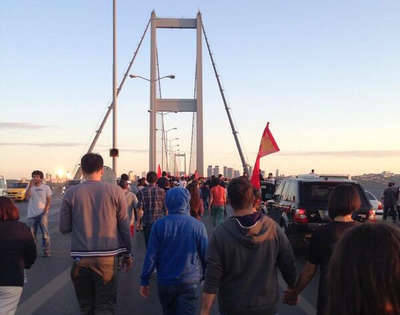 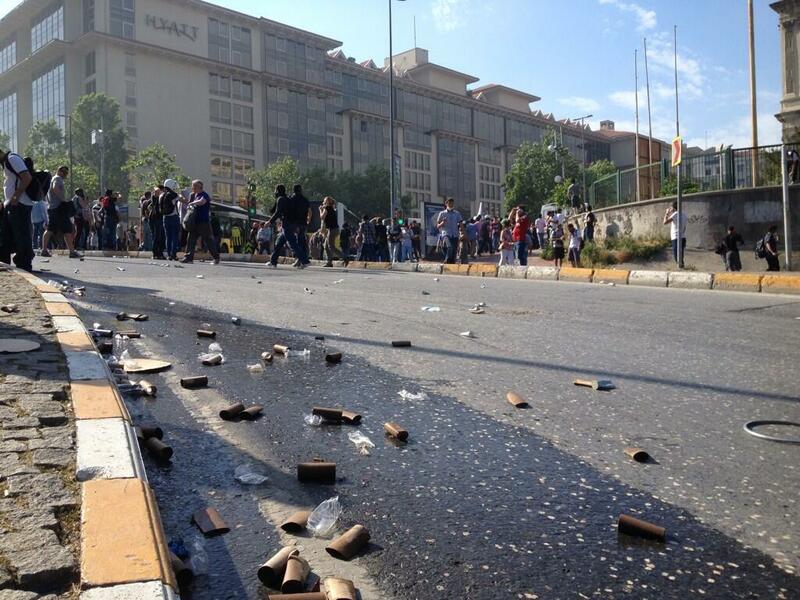 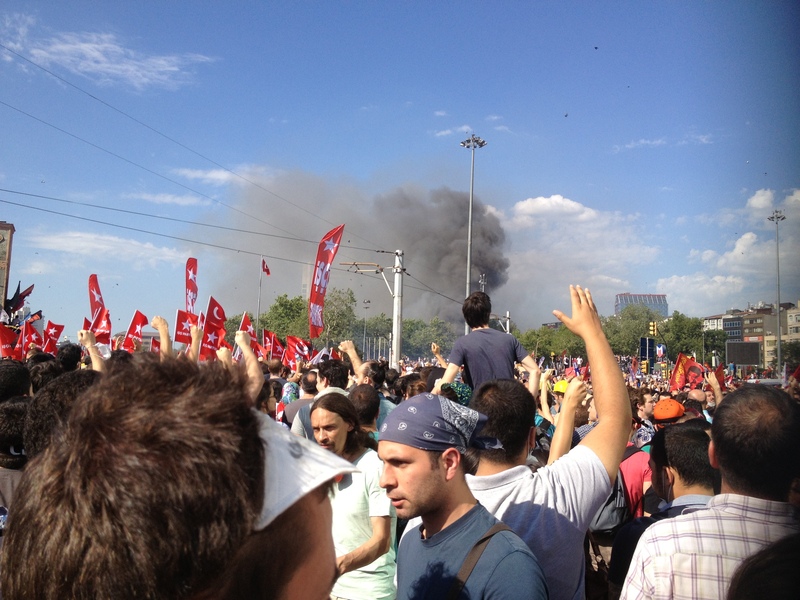 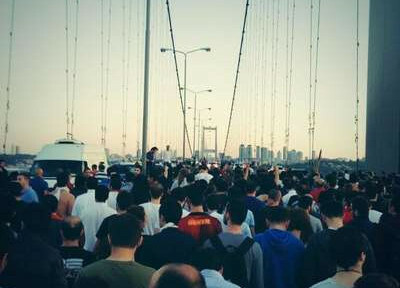 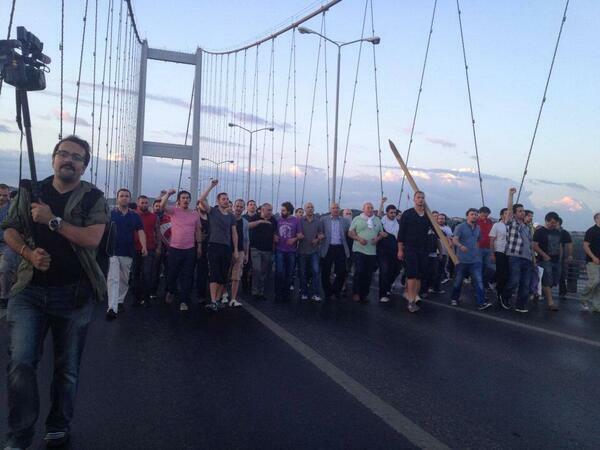 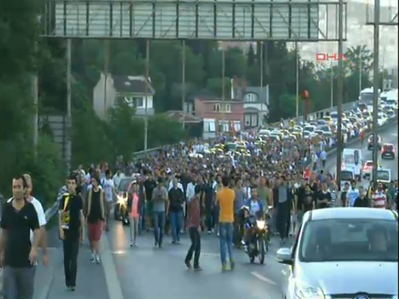 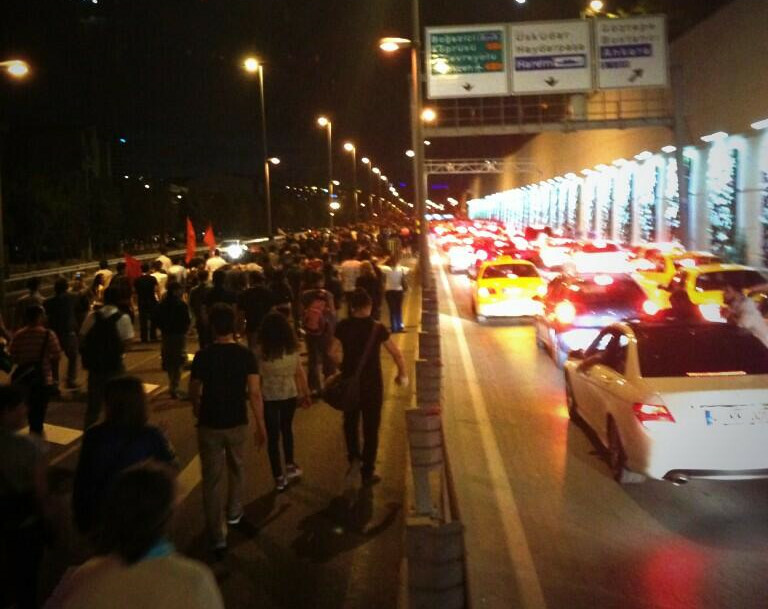 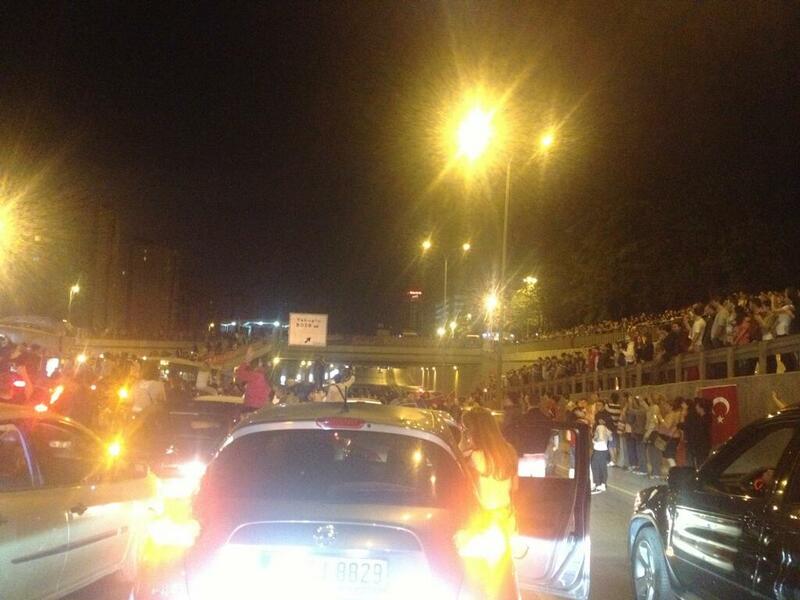 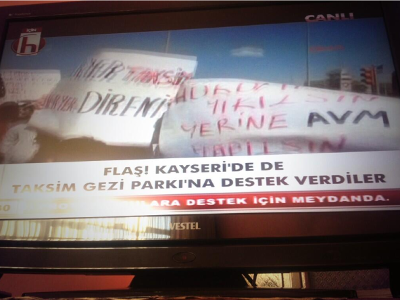 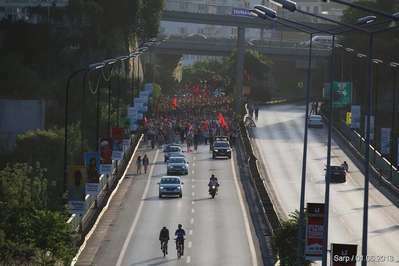 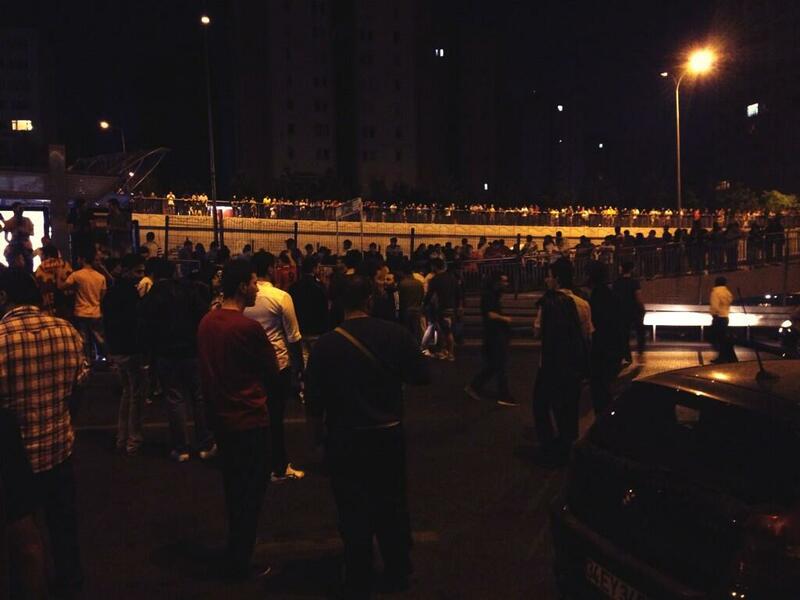 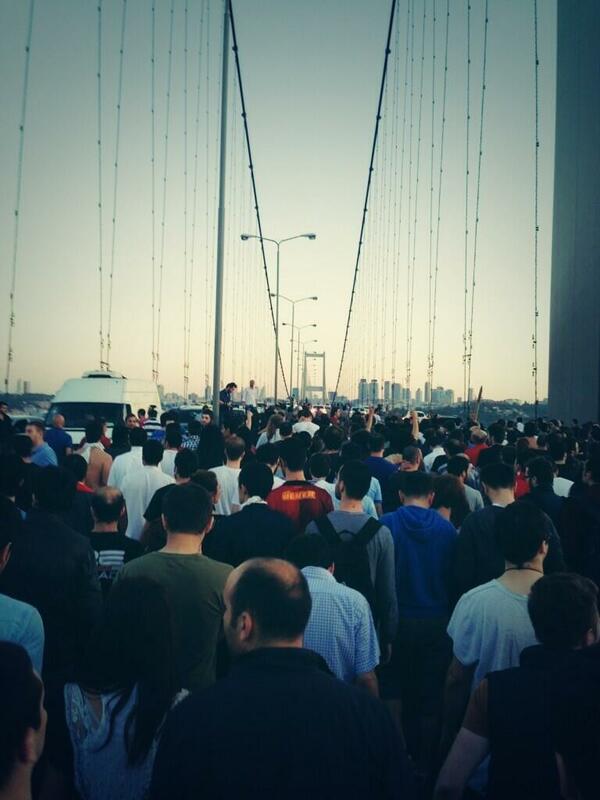 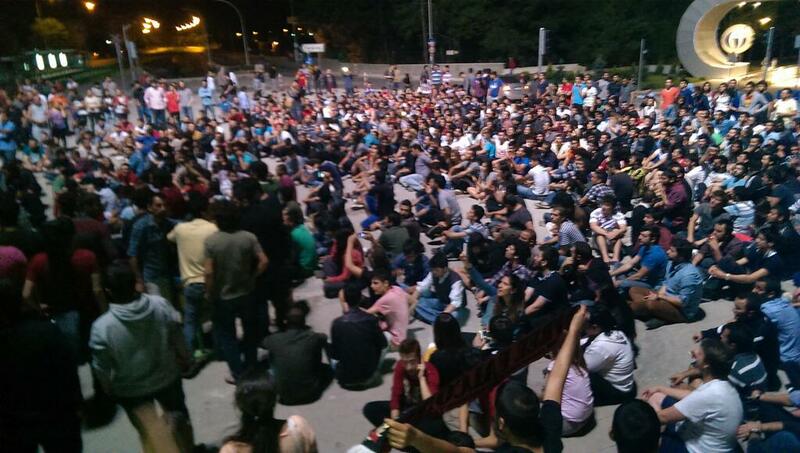 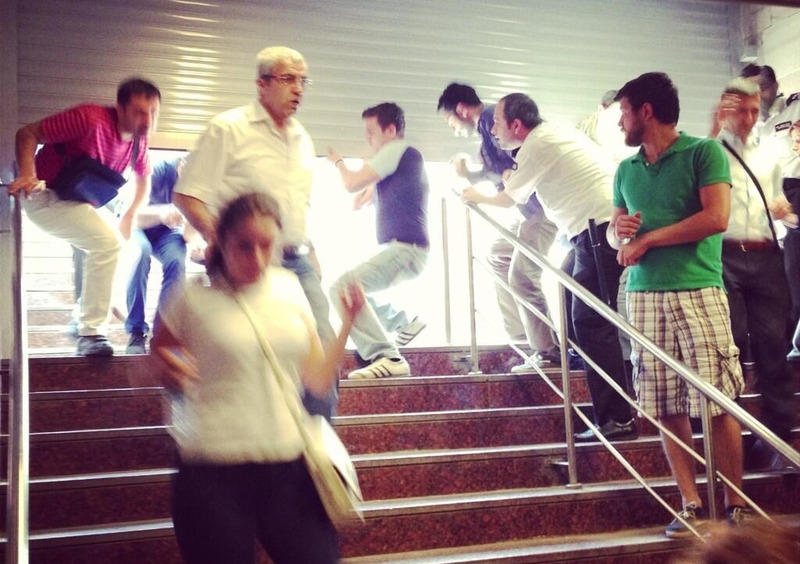 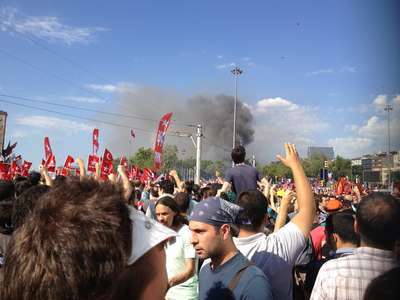 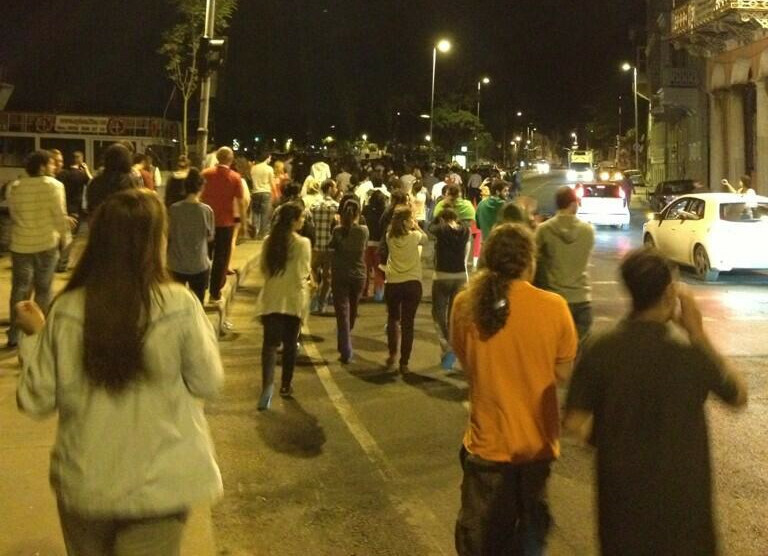 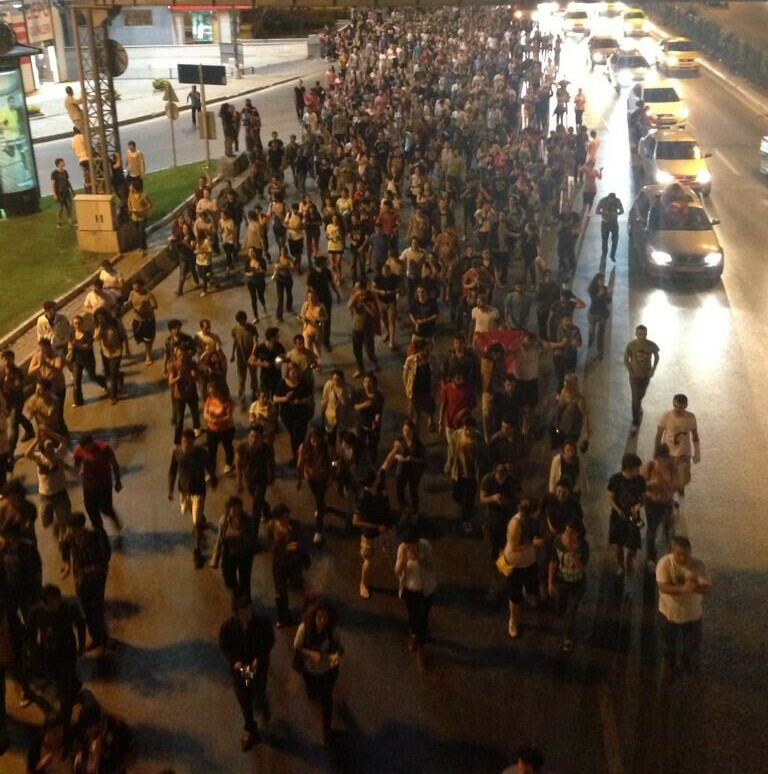 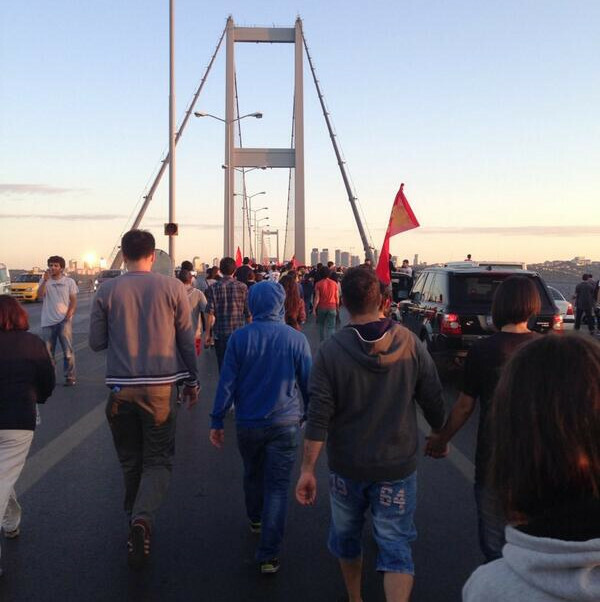 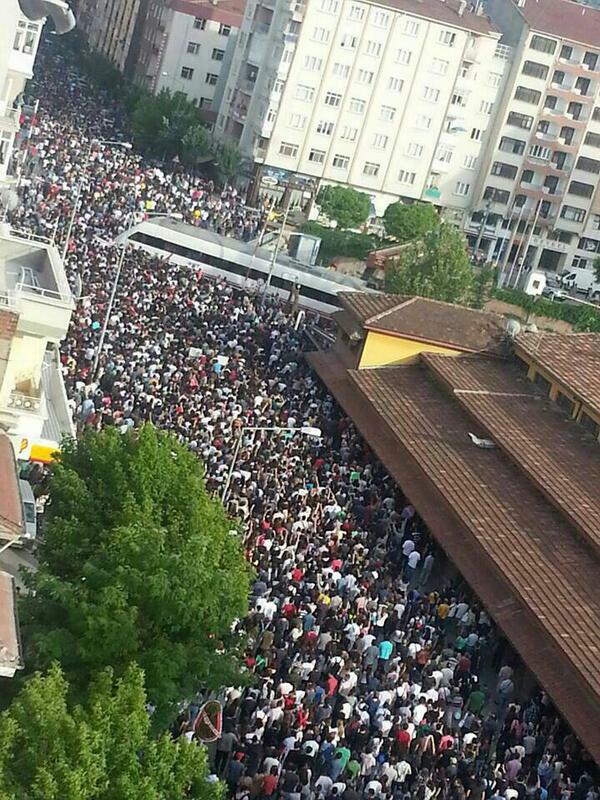 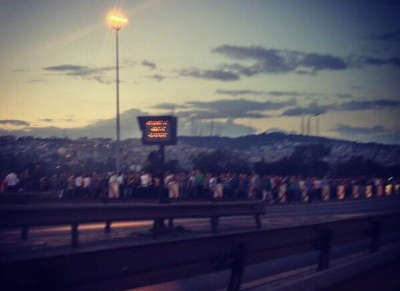 Due to shutdown Taksim station, protesters occupied highways to cross the bridge with dawn. 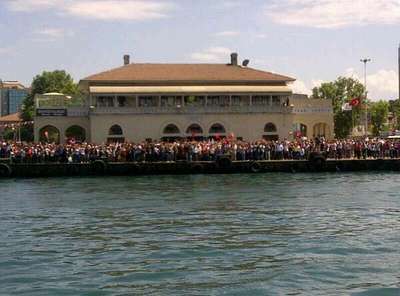 Kadıköy port, İstanbul. 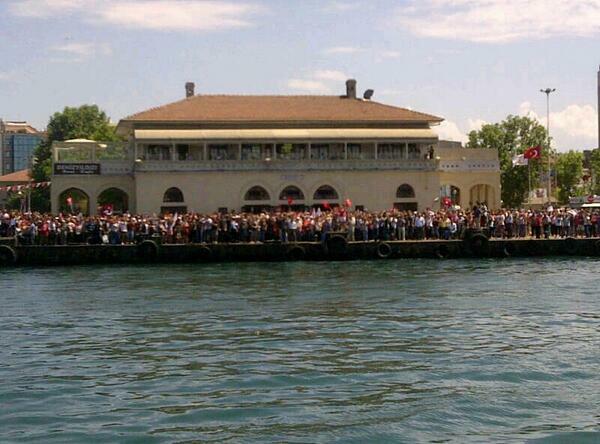 Crowd waits for a ferry to pass to the European side. 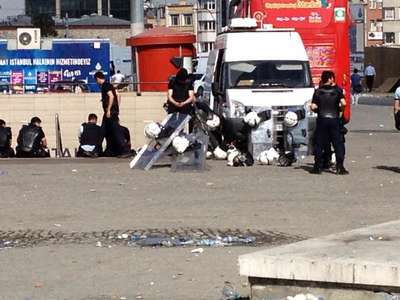 Due to long working hours, tired police forces taking a break. 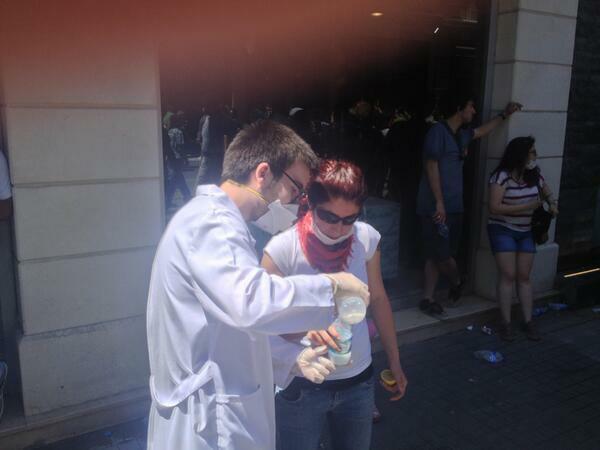 Medical school students helping injured protesters. 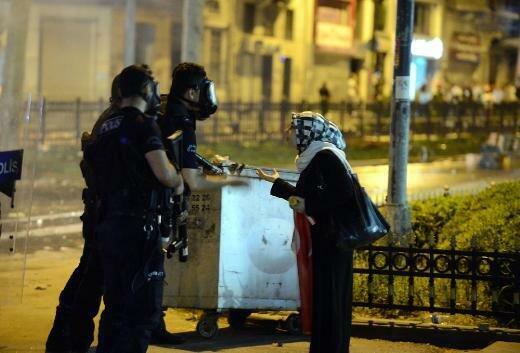 Civilians sharing their milk, lemon and vinegar with protesters. 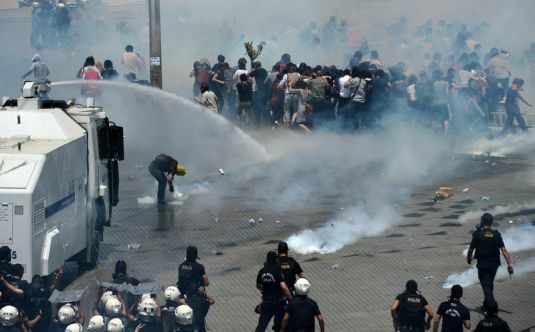 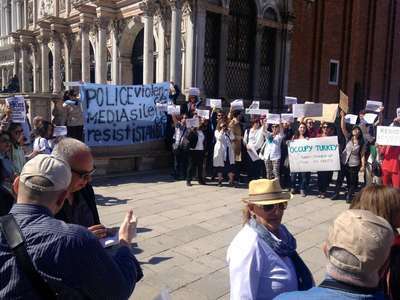 The claims of police forces clash with civilians, of whom the police forces themselves originate from, and attack them to the point of injury have no grounds. 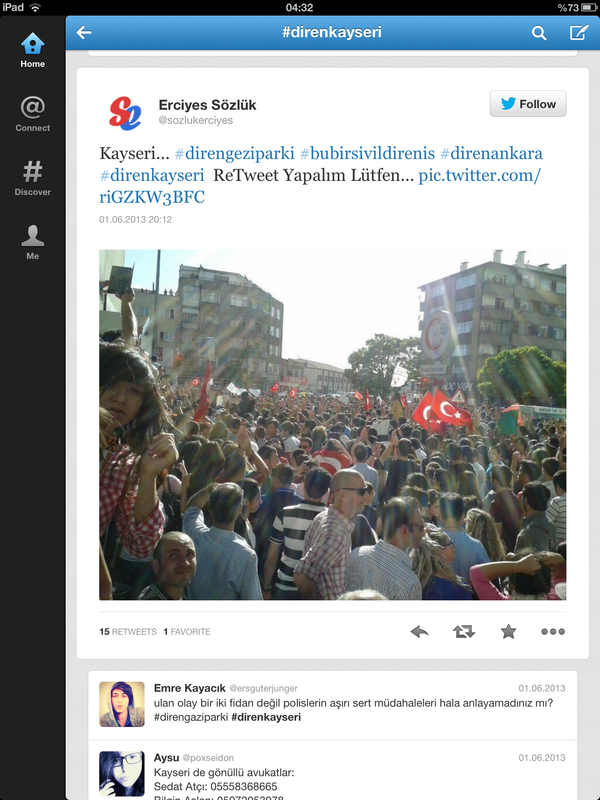 A majority of the AKP supporters is known to be originating from conservative citizens. 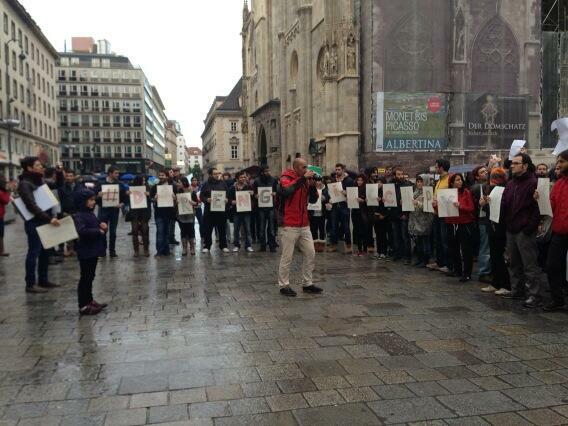 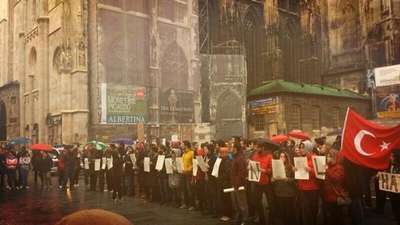 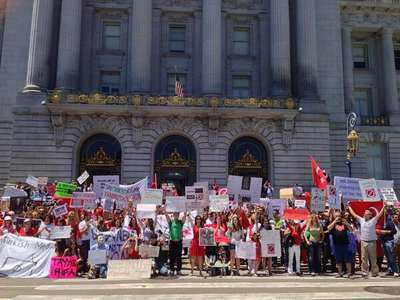 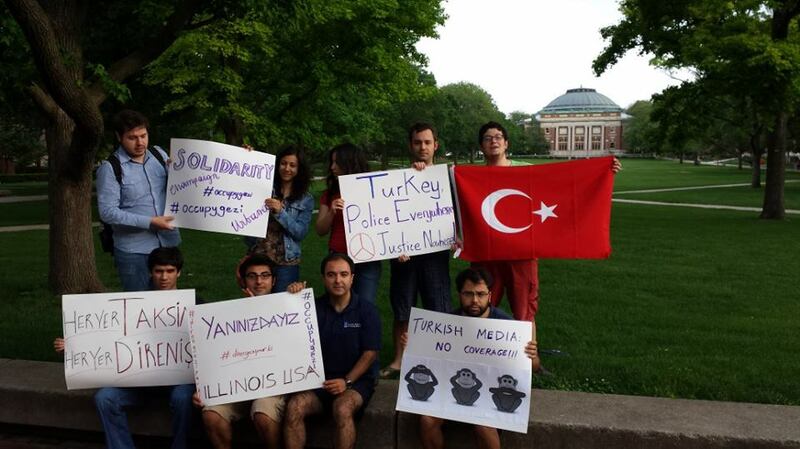 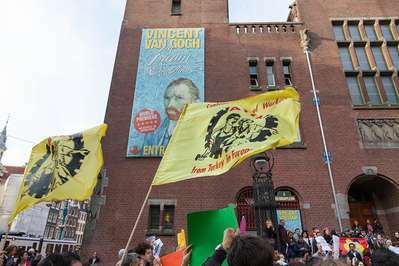 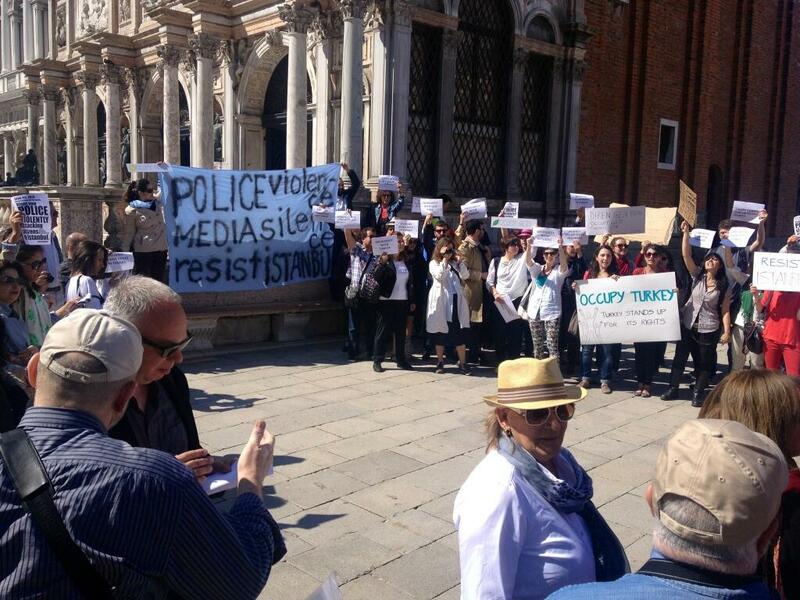 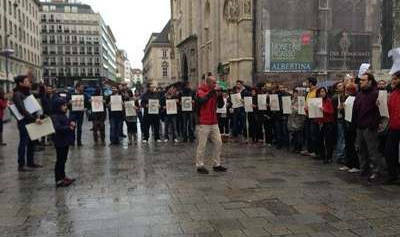 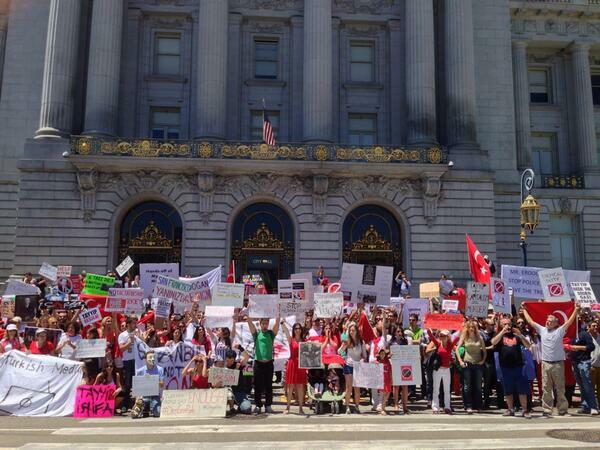 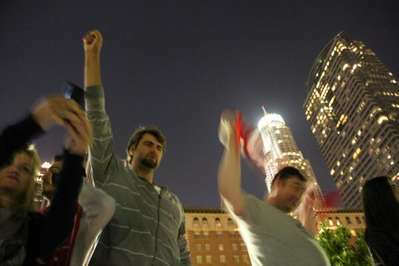 However, as depicted in this photo, protests got support from people of different backgrounds. 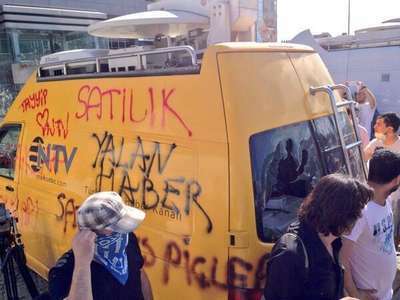 Vandalised mobile broadcast unit of a local TV channel. 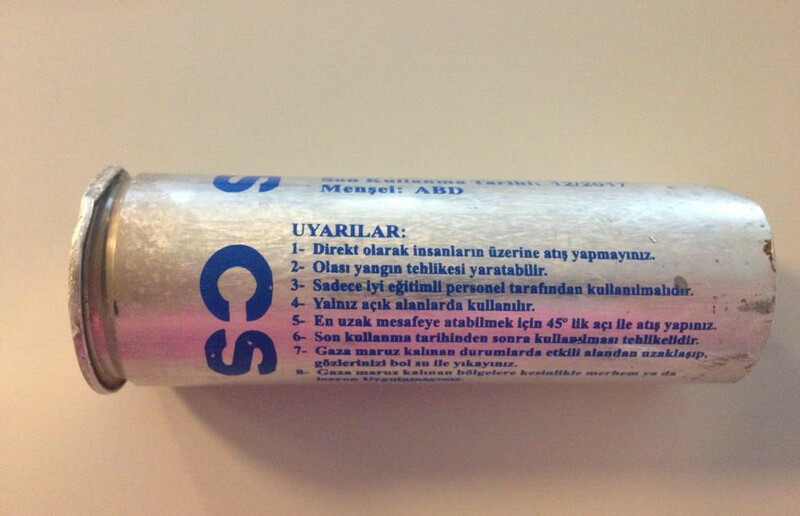 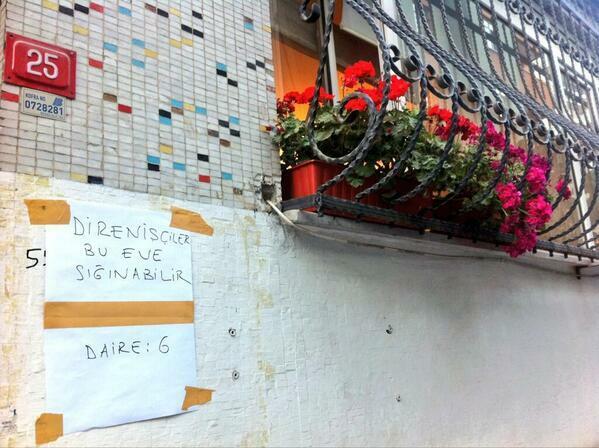 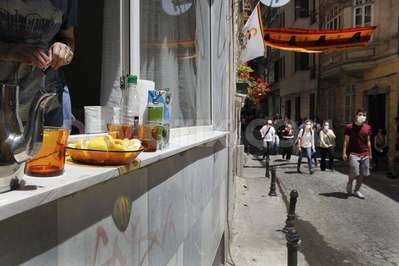 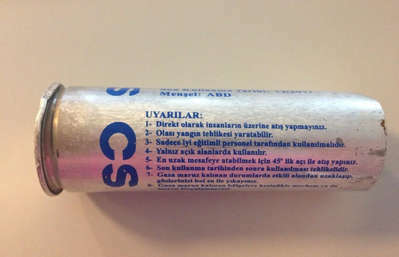 A tear gas shell stucked into the windows of a shop in İstiklal, İstanbul. 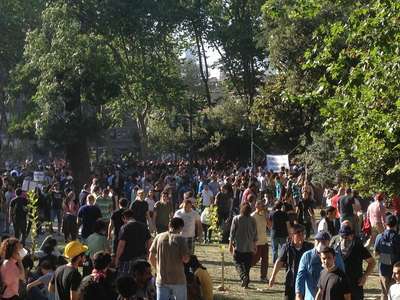 It has been said that trees will get cut in Taksim. 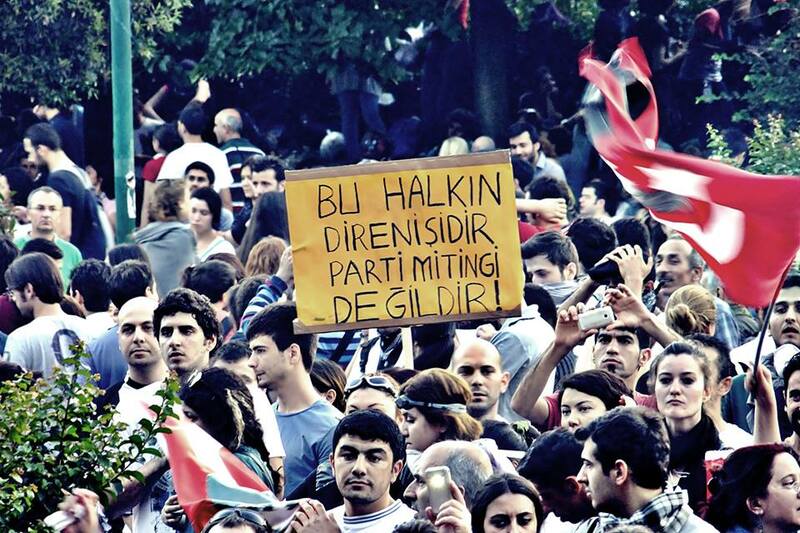 Whoever said this, it has no grounds. 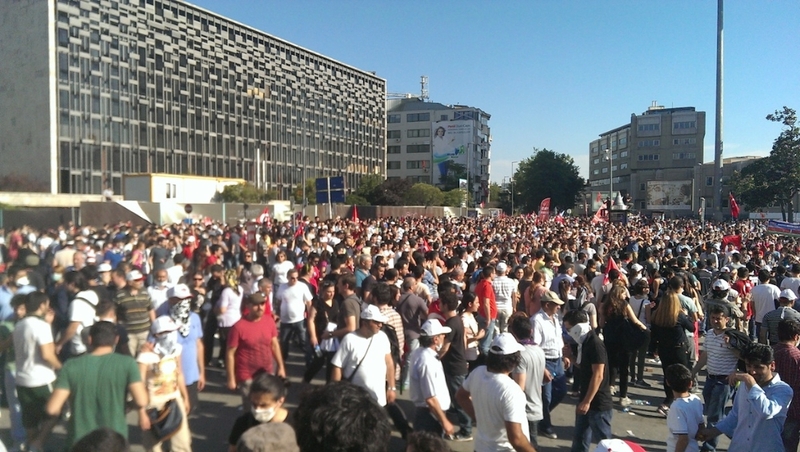 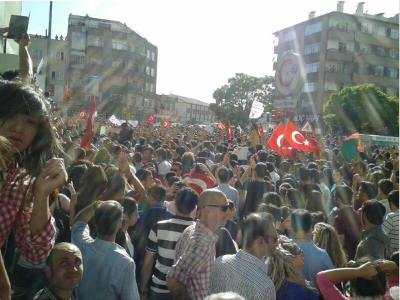 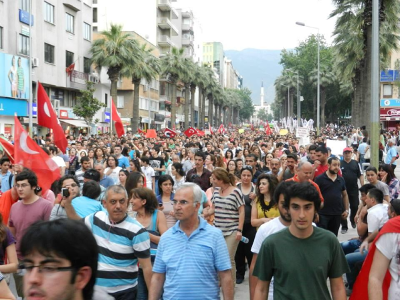 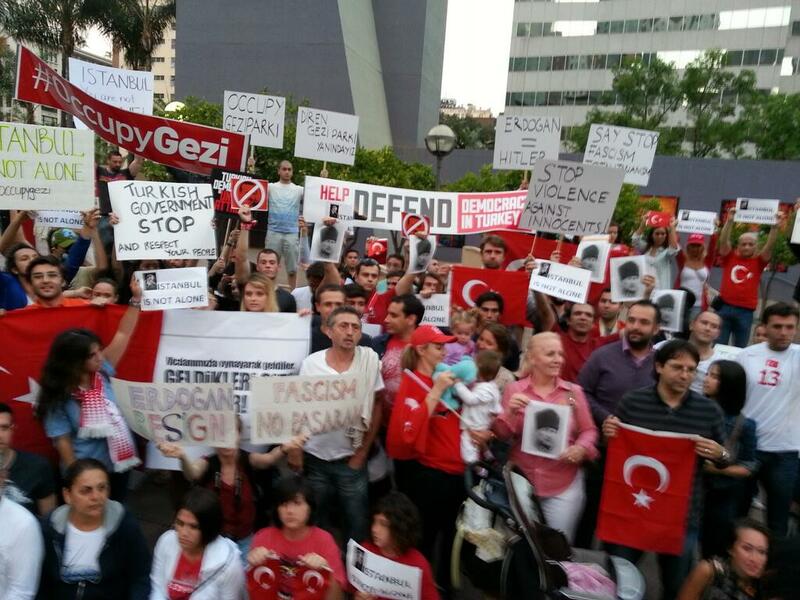 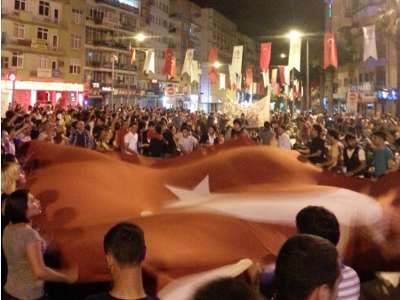 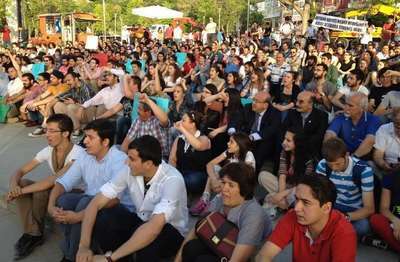 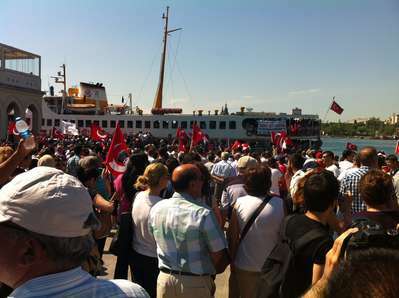 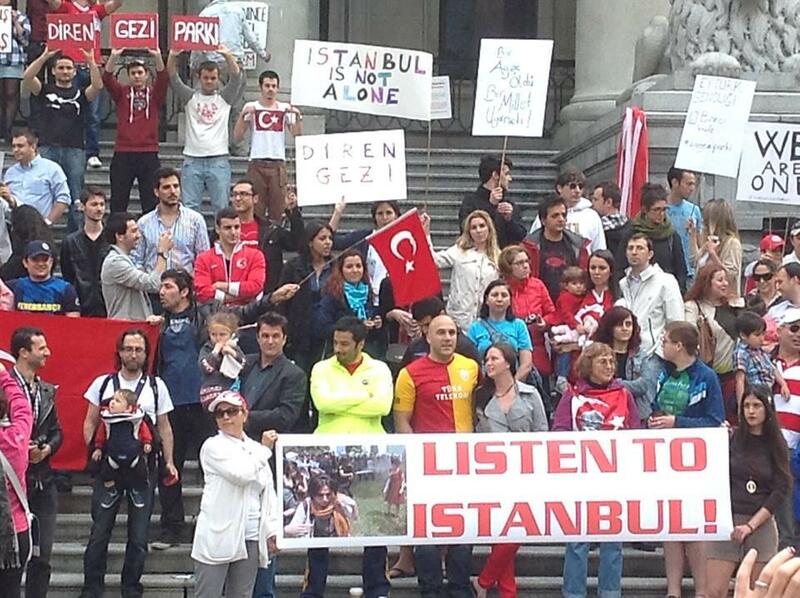 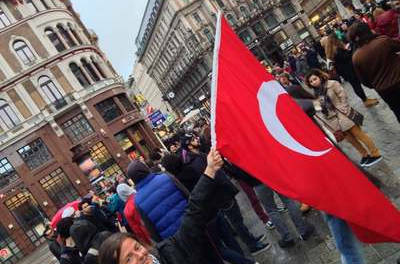 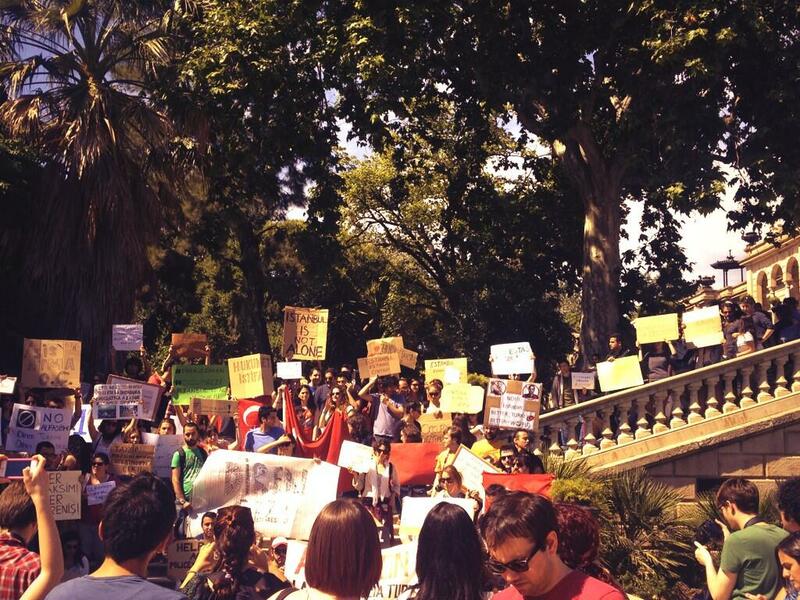 Throughout the Turkey, many people supported the protests by making noise. 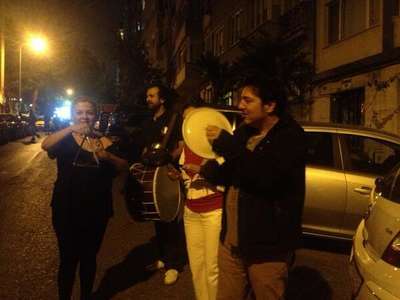 Pianist Fazıl Say was one of them. 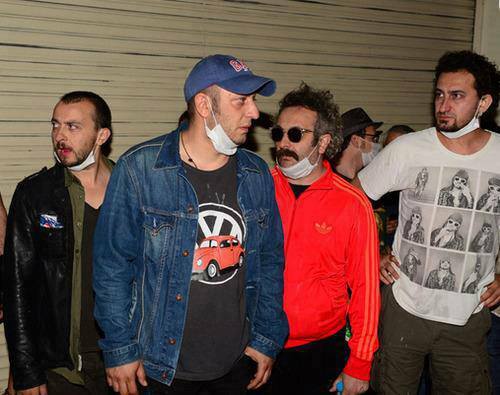 Actors from "Leyla ile Mecnun" TV series. 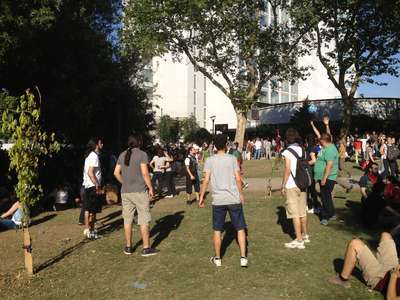 Pop singer Emre Altuğ at Gezi Park. 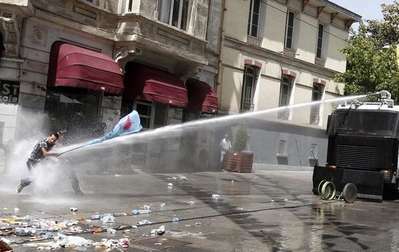 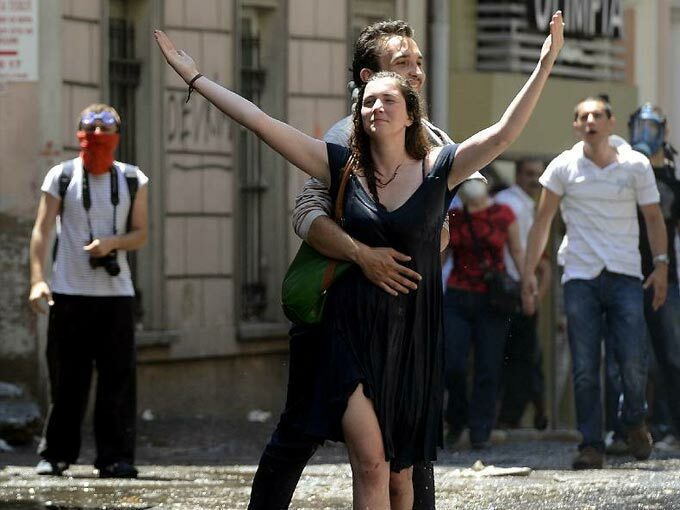 The fall back of police forces declined the tension in Taksim. 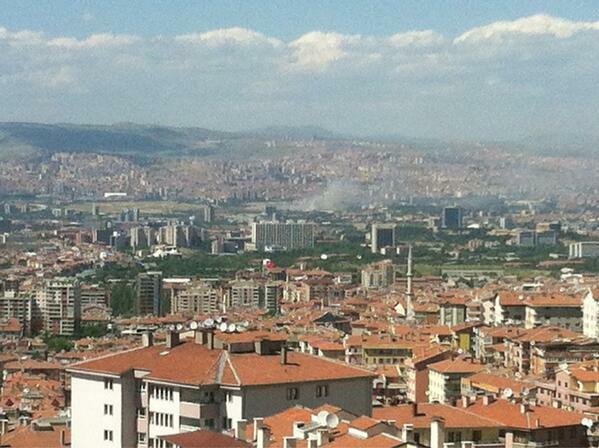 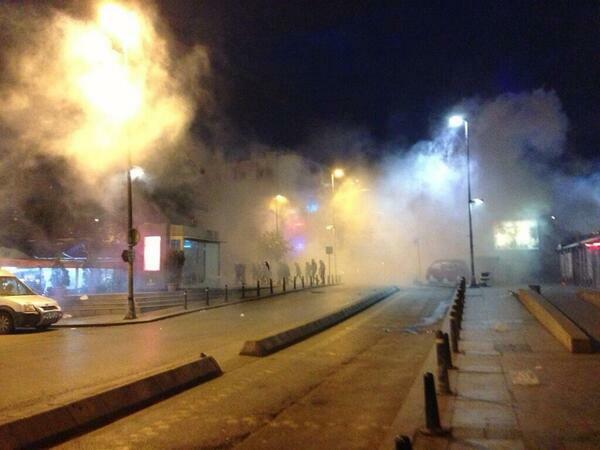 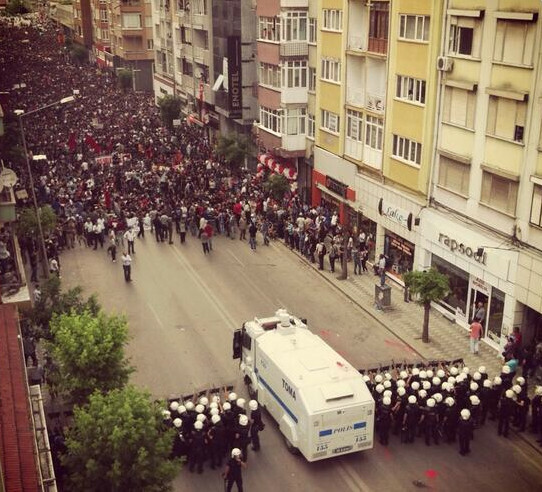 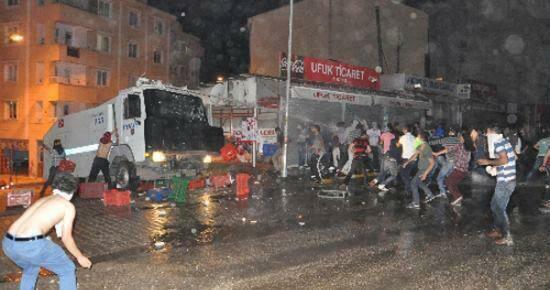 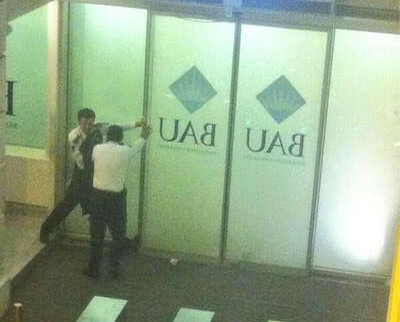 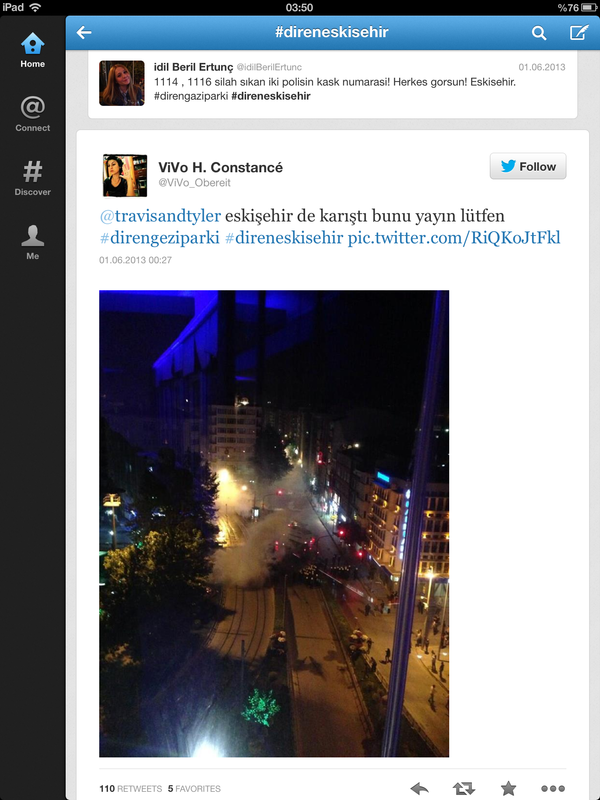 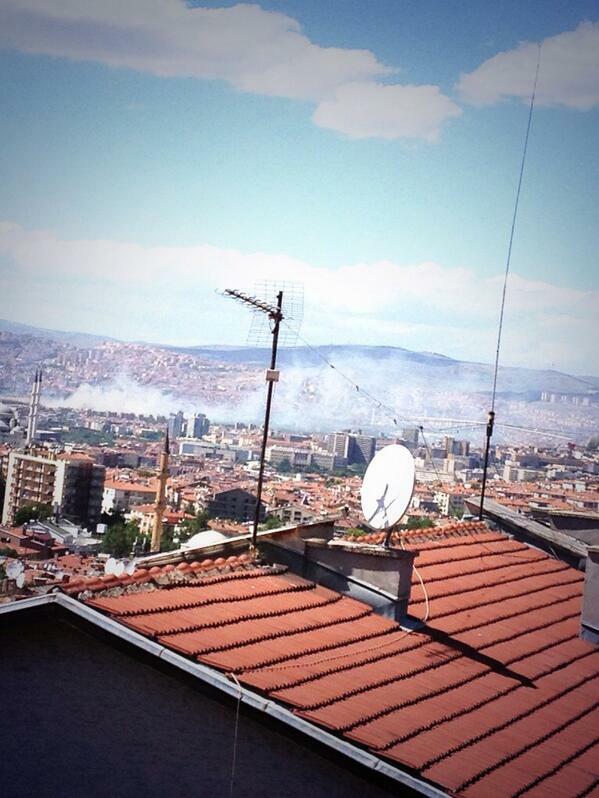 That being said, clashes in Beşiktaş got worsened. A view of Beşiktaş from the Anatolian side. 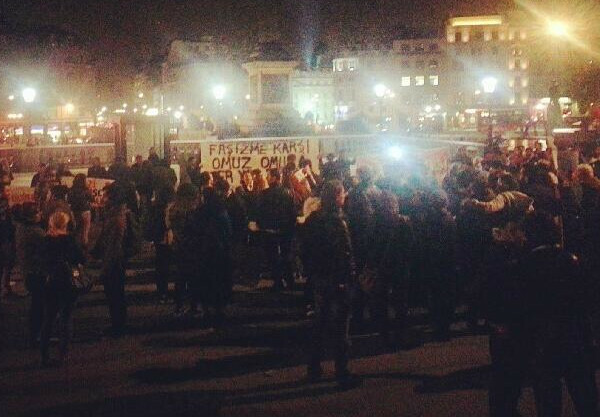 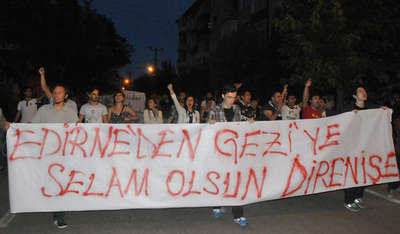 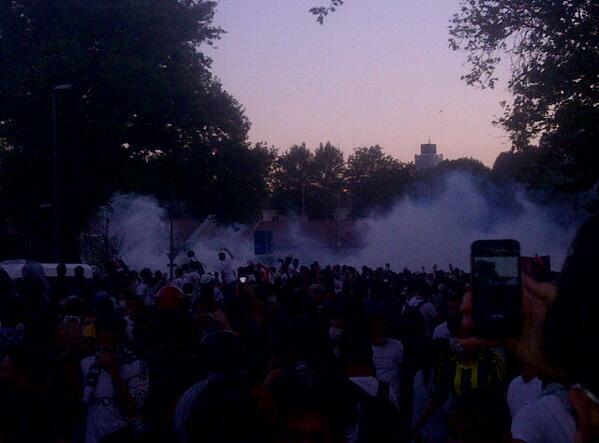 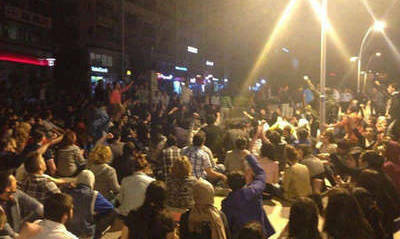 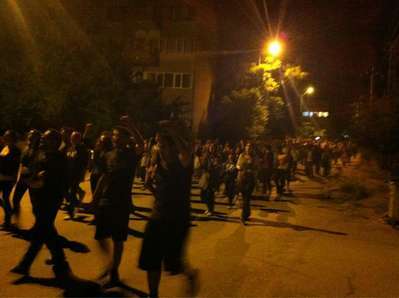 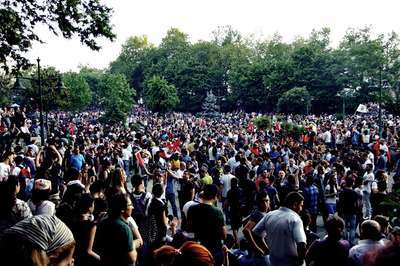 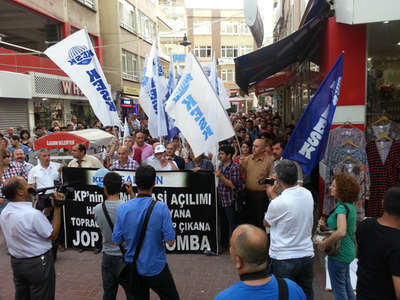 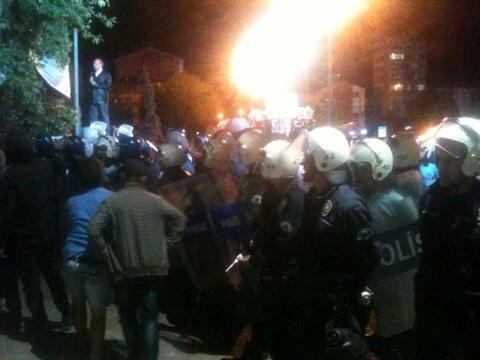 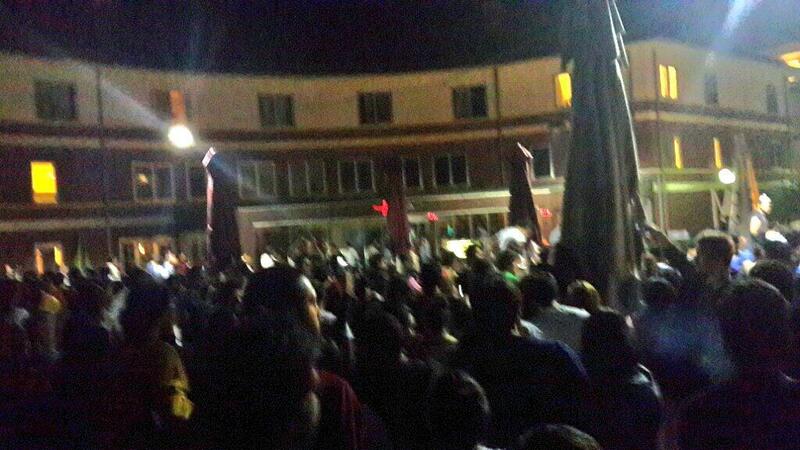 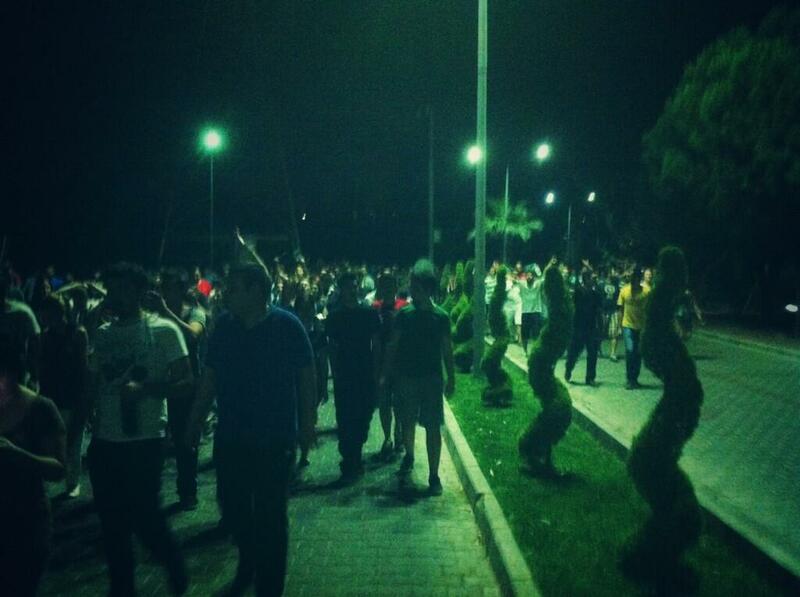 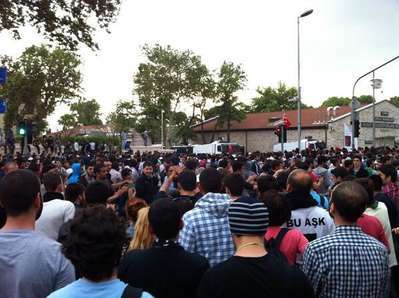 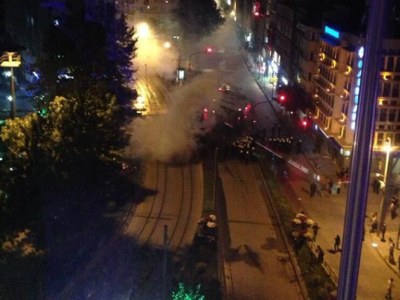 Before police forces intervene, protests behind the prime minister's residence in Beşiktaş, İstanbul. 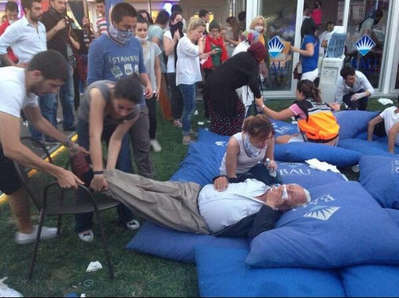 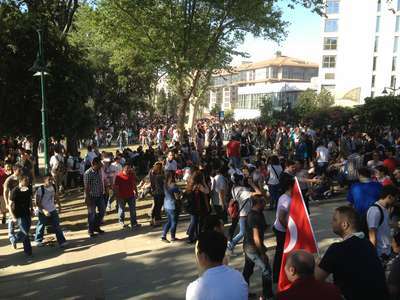 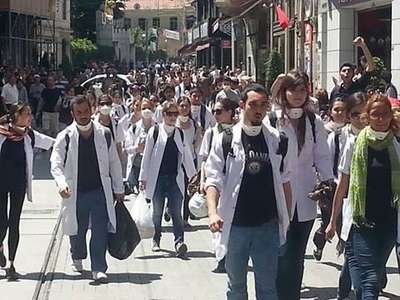 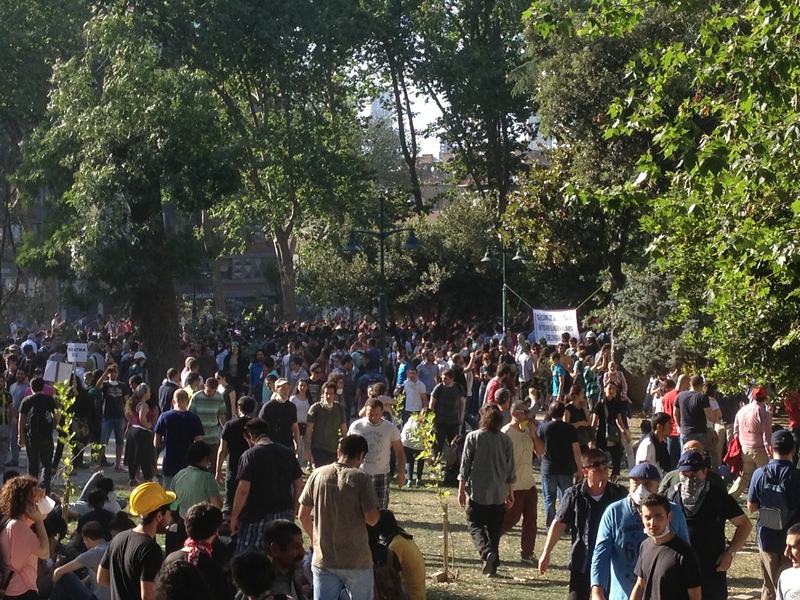 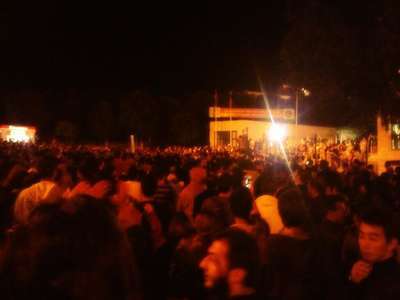 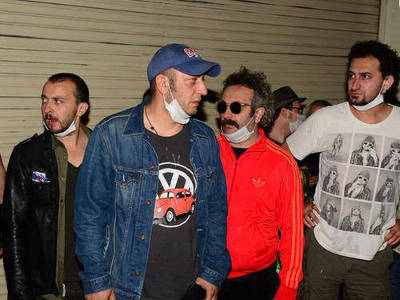 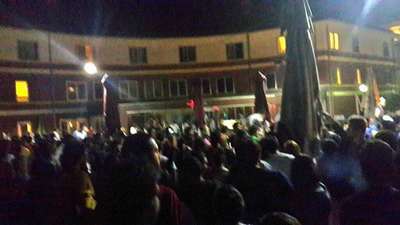 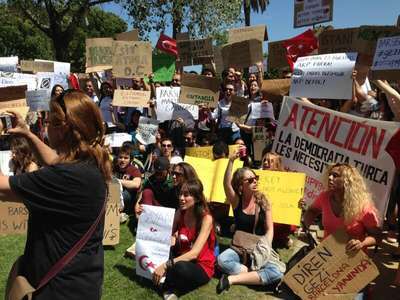 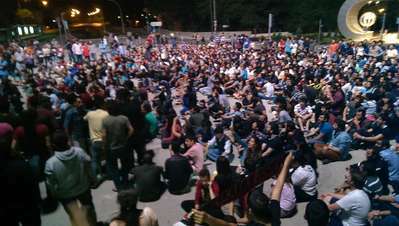 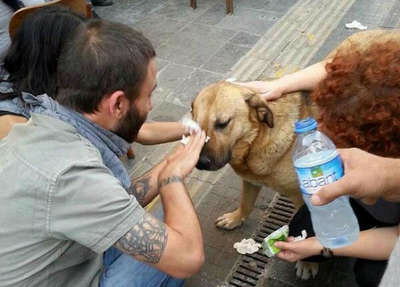 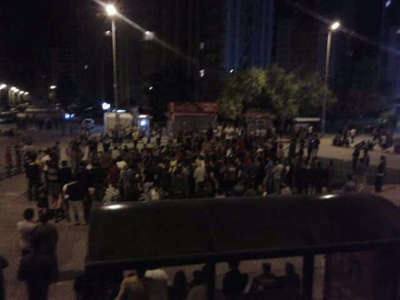 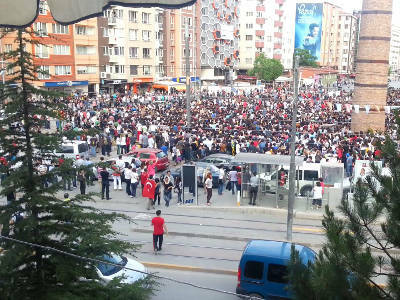 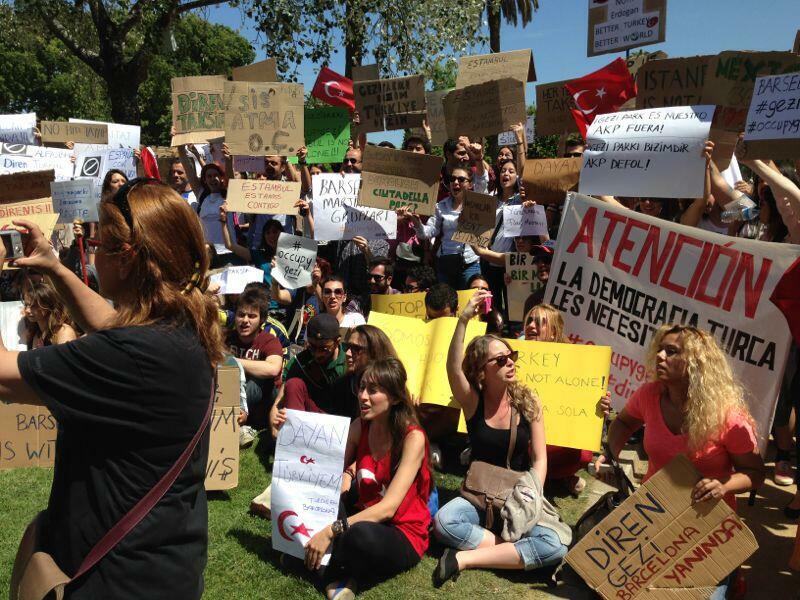 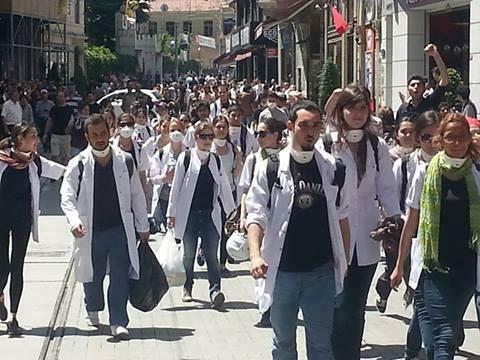 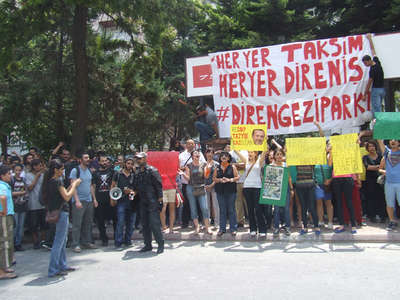 In Beşiktaş, Bahçeşehir University is filled with the protesters for medical care. A photo of Beşiktaş, İstanbul taken from a ferry. After midnight, police forces fall back from Beşiktaş. 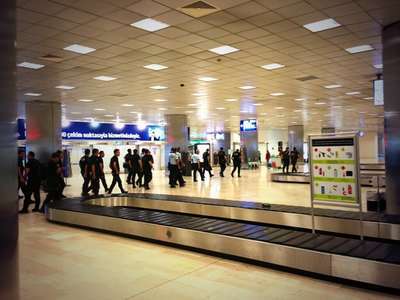 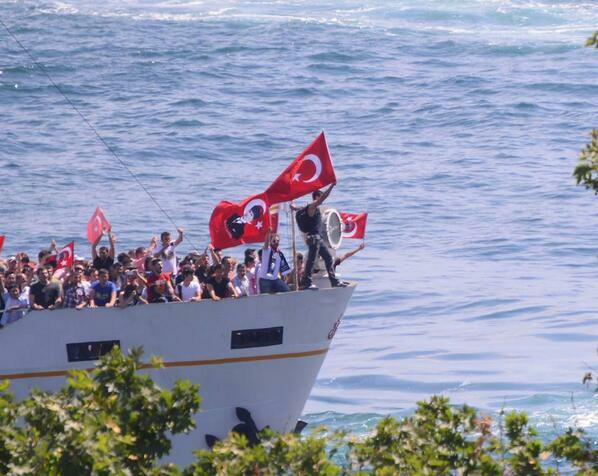 Police forces around the Turkey are getting transferred to İstanbul. 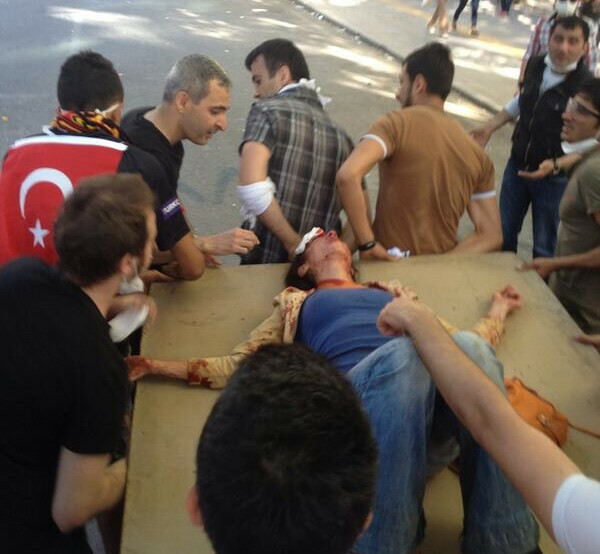 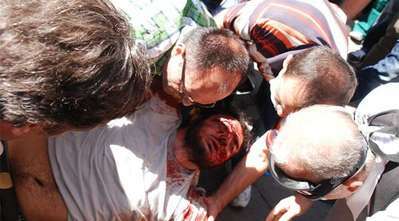 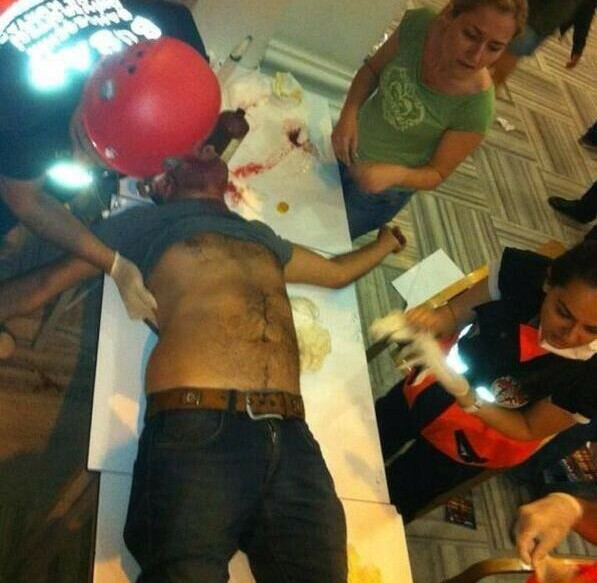 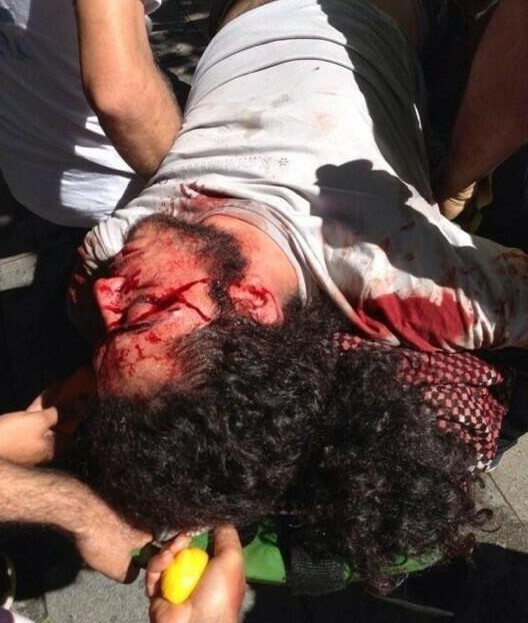 An injured protester in İstanbul. 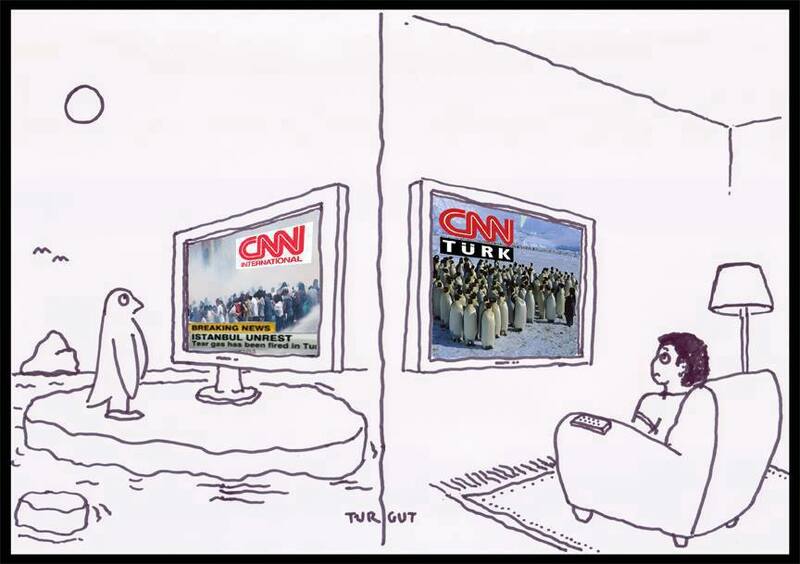 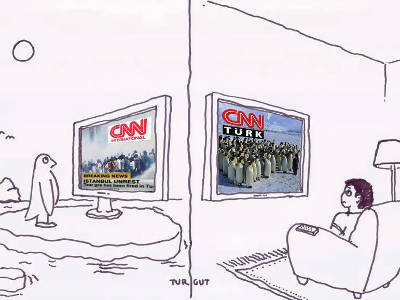 A comic about the penguin documentary shown by CNN Turk channel. 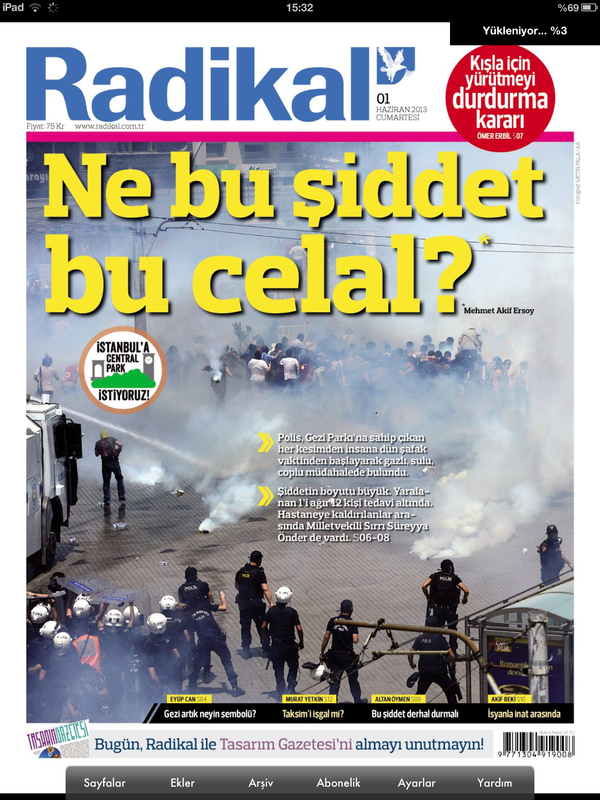 Radikal headline critisizes the violence. 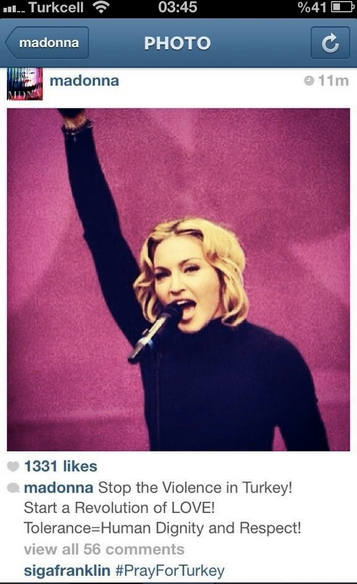 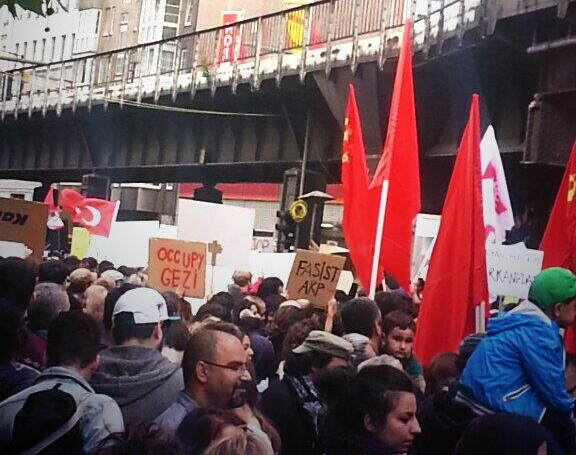 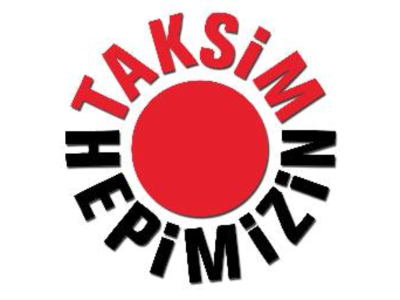 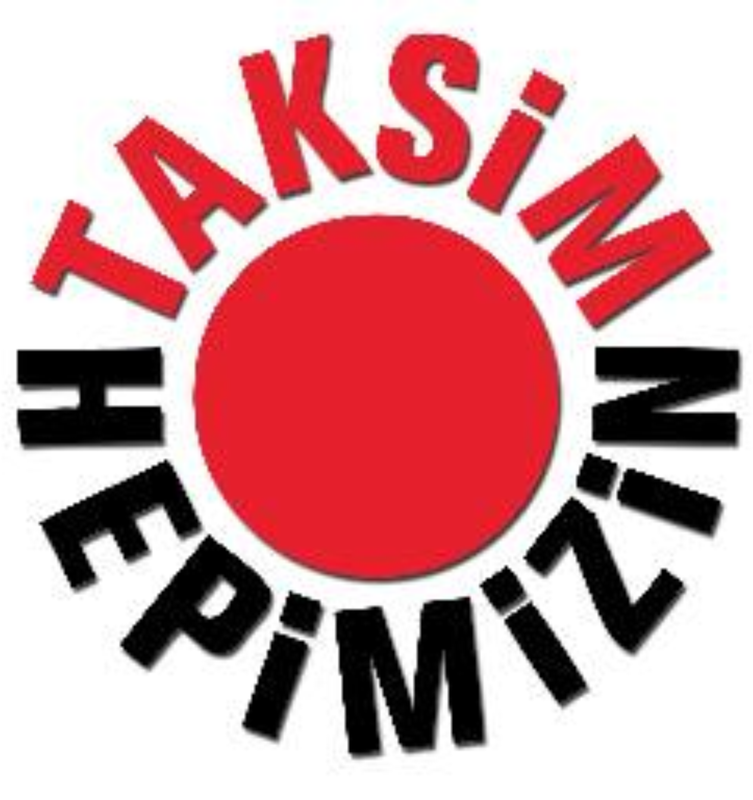 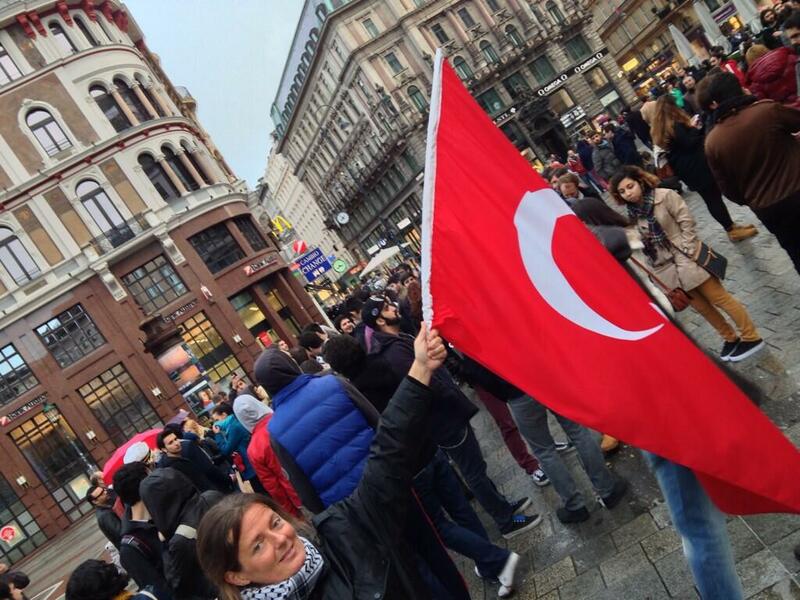 "Taksim belongs to all of us." 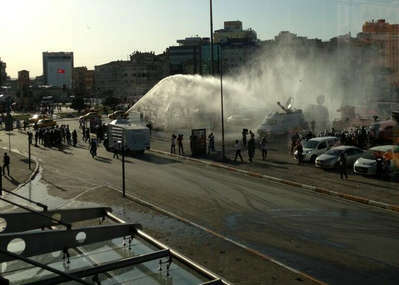 Police is watering protestors in Eskişehir. 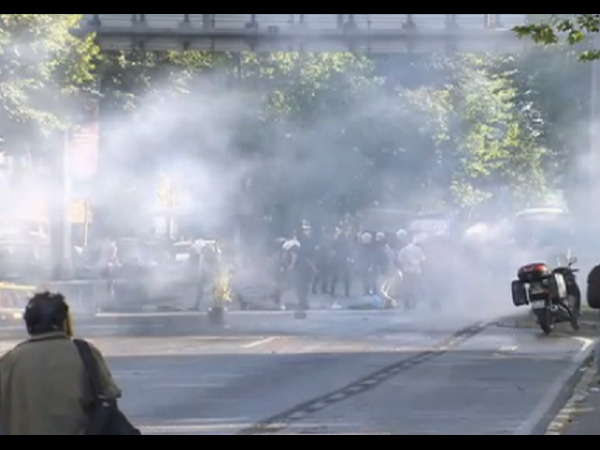 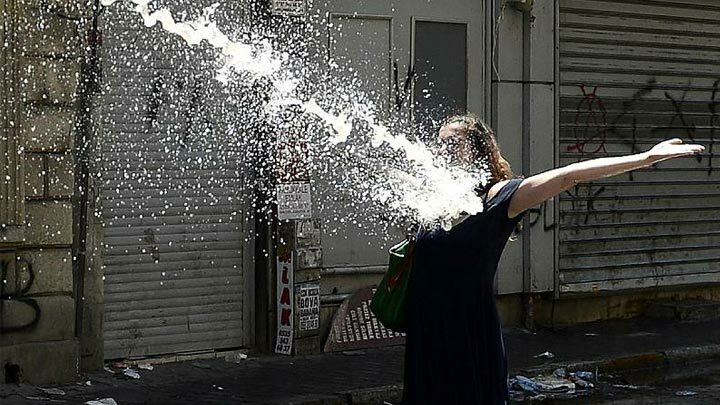 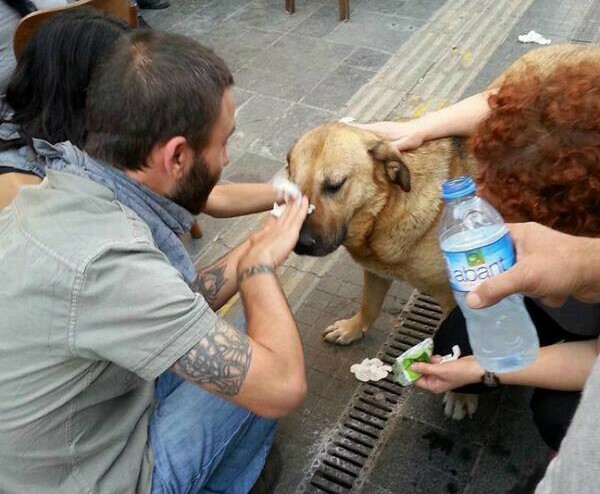 How police is treating protestors in Ankara. 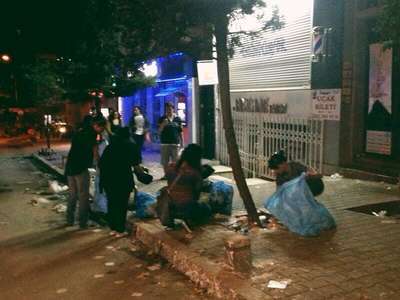 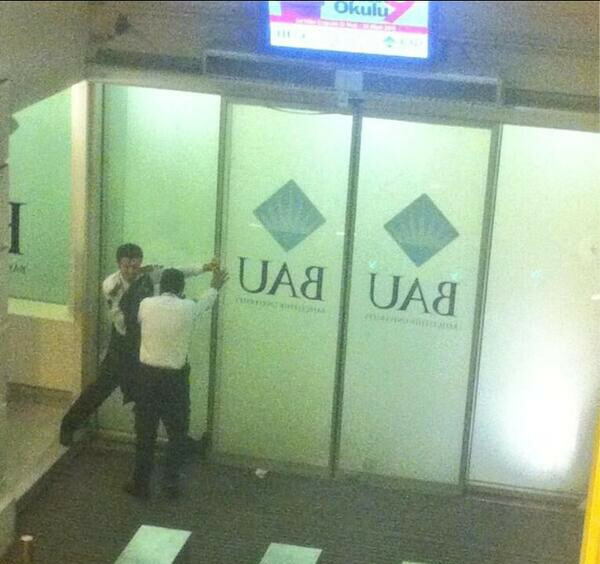 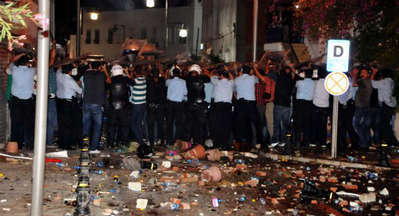 A dozen of police officers attacking against a lady in İzmir. 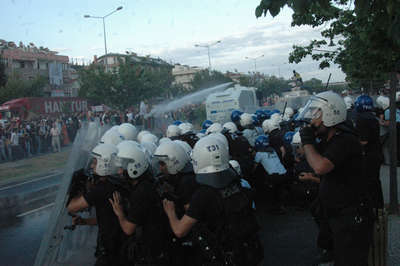 Clash of police and protestors. 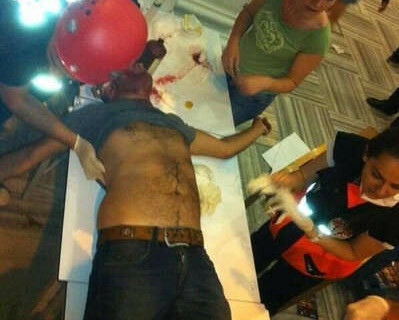 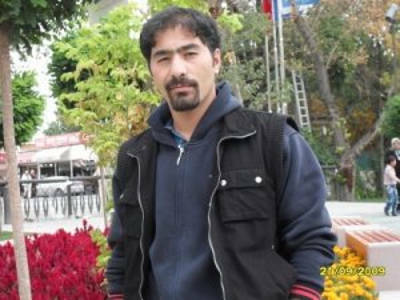 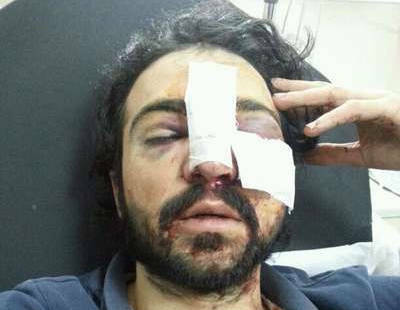 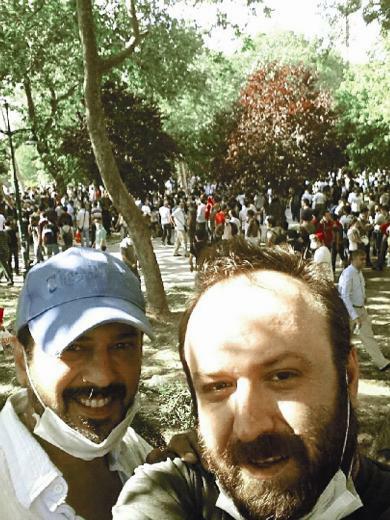 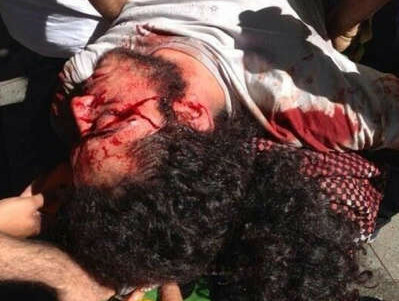 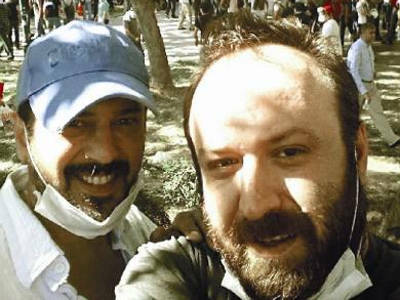 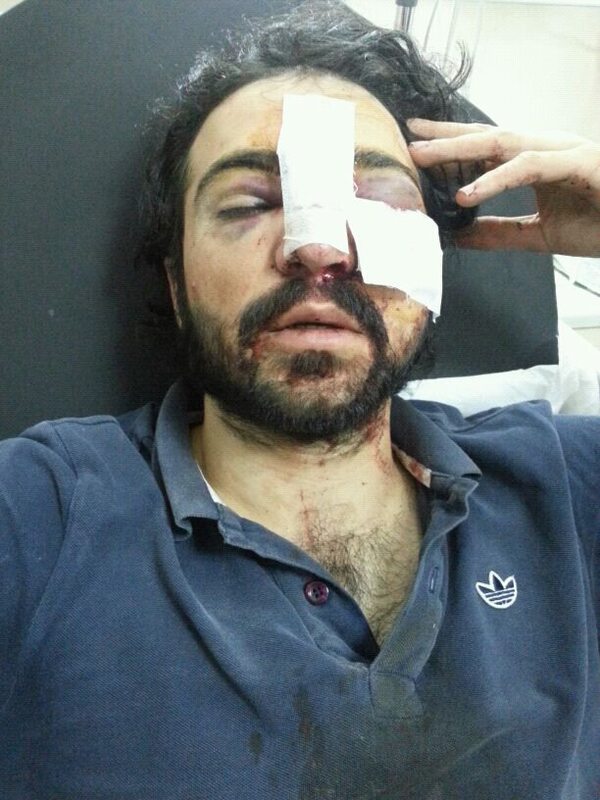 Ethem Sarısülük had injured severely during clashes in Ankara, Turkey. Doğu Akdeniz Üniversitesi, Northern Cyprus. 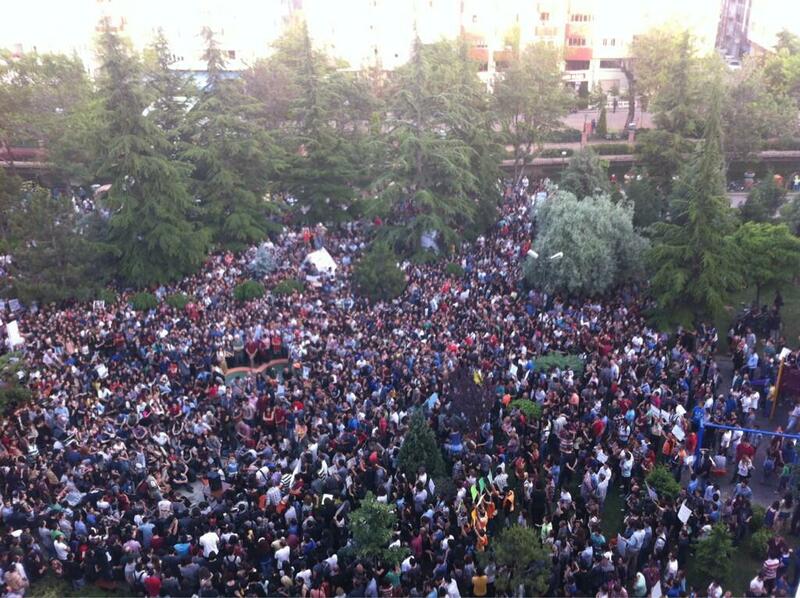 Middle East Technical University, Ankara, Turkey. 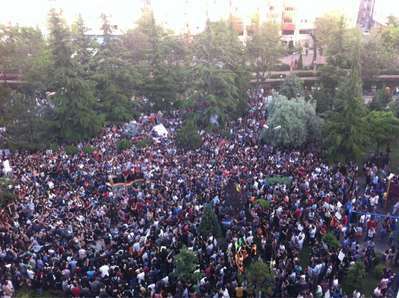 A scene from Eskişehir, Turkey. 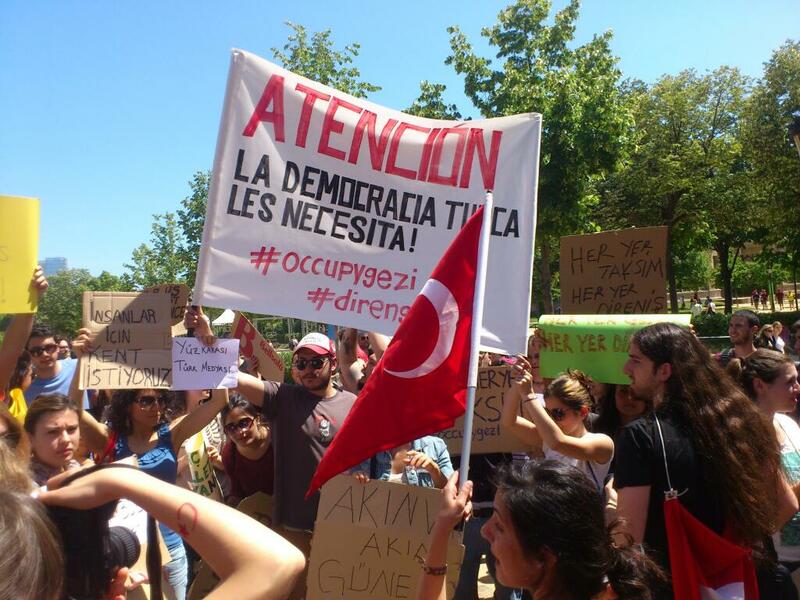 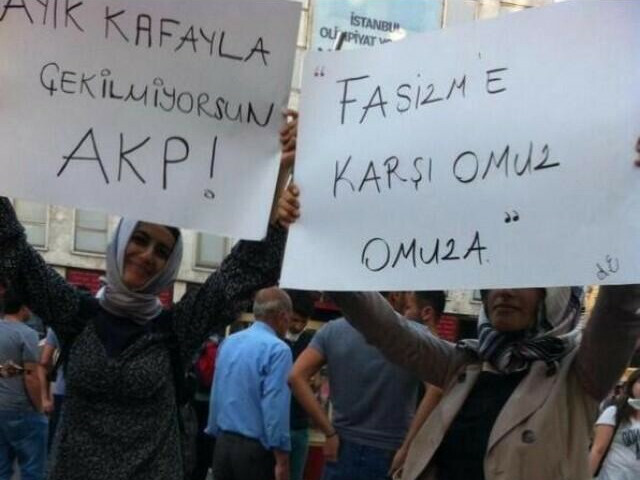 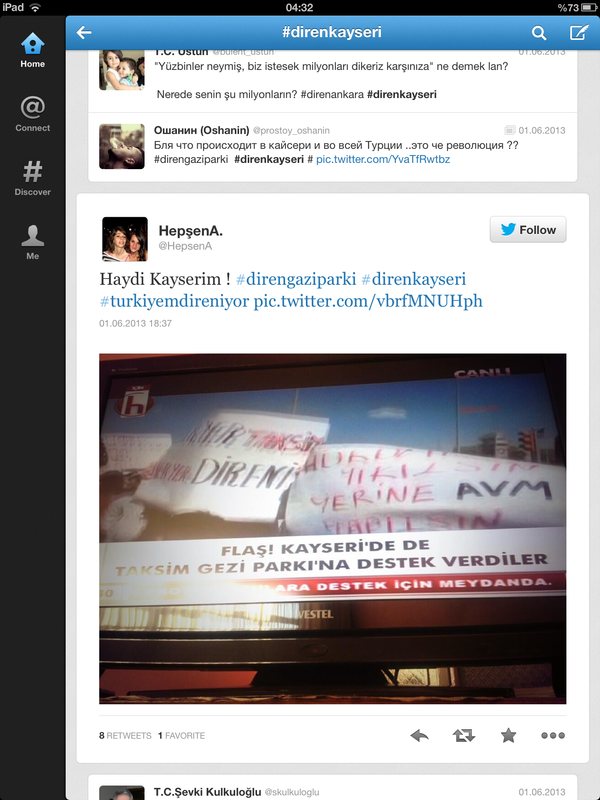 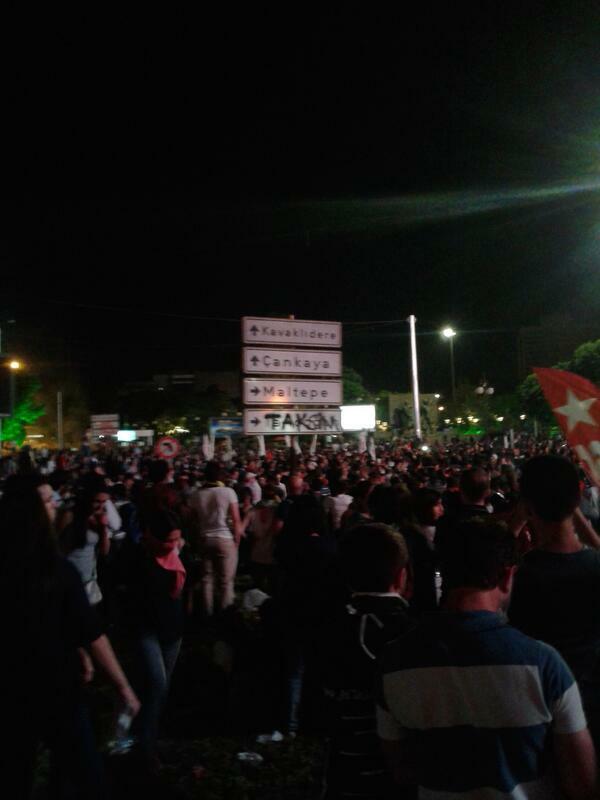 In Ankara, Turkey, protesters change the name of the signs to point to the Taksim. 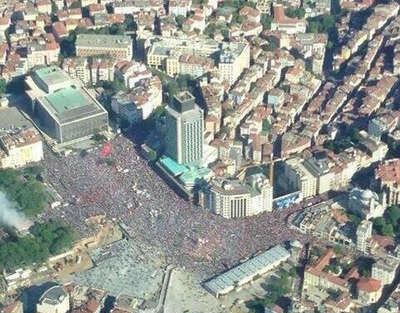 An air view of Ankara, Turkey. 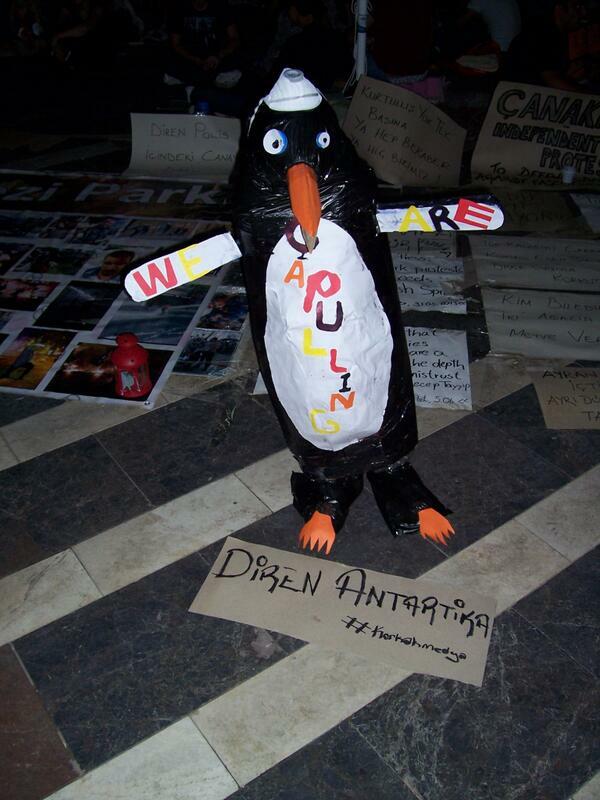 I swear to God that we could have drown you in a spoon but you should pray that we believe in democracy. Crowds on the Atatürk Ave. in Ankara, Turkey. 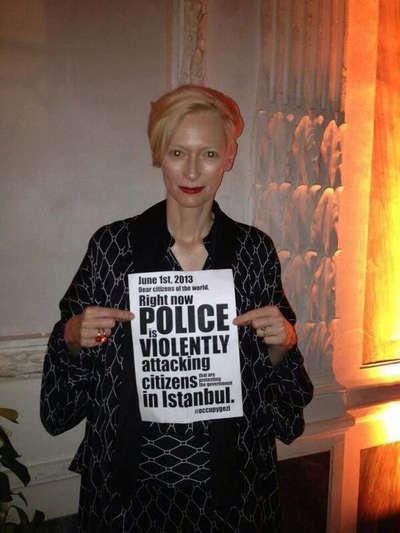 Actress and model Tilda Swinton. 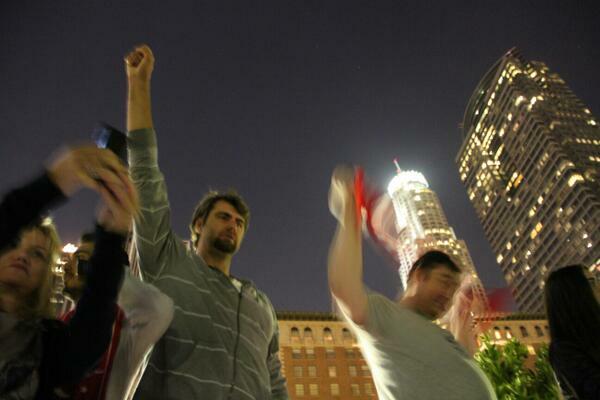 Turkish NBA player Mehmet Okur. 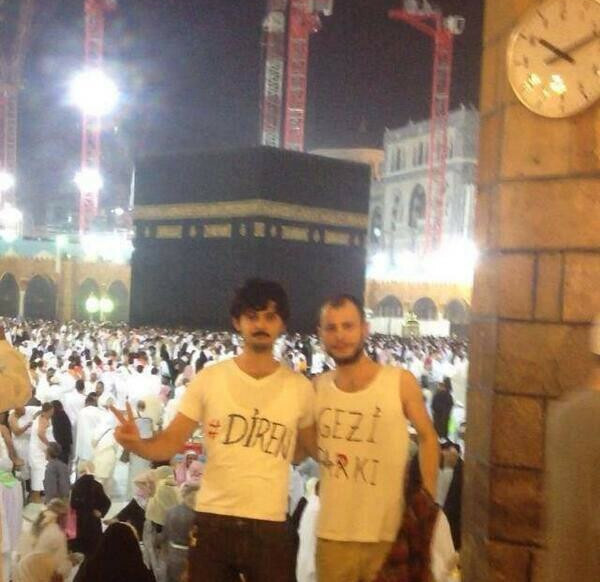 Sacred House, Mecca, Saudi Arabia.